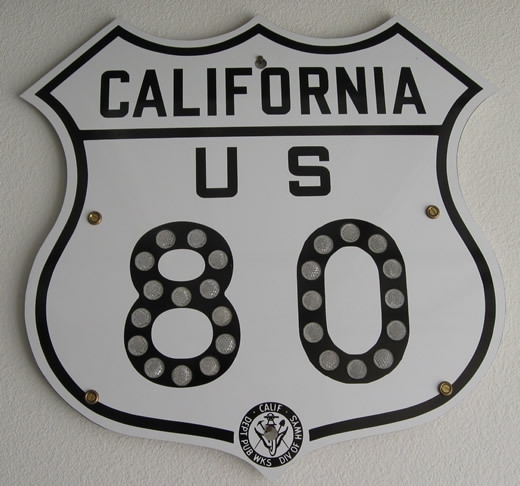 This replica U.S. 80 shield was constructed using specifications set during the era when route markers had the California Department of Public Works, Division of Highways logo at the bottom of the six-point U.S. shield. Replica cat-eyes allow for nighttime reflectivity of the numerical designation. 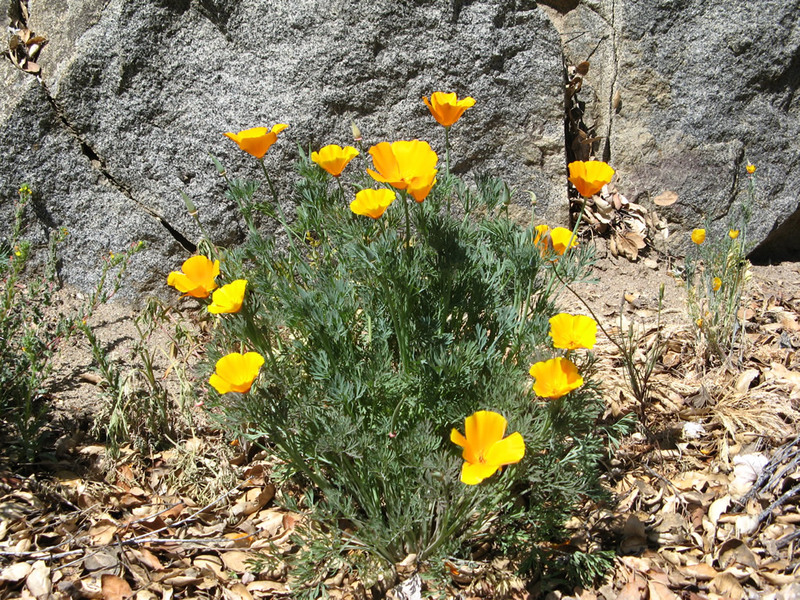 Photo taken 06/18/11. 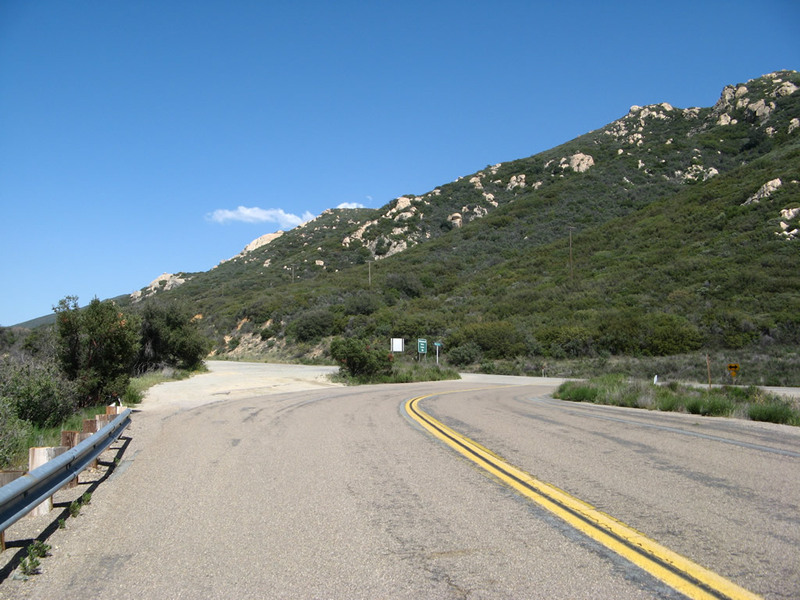 U.S. 80, the Broadway of America, used to follow the southern tier of California, connecting San Diego with La Mesa, El Cajon, Alpine, Boulevard, Jacumba Hot Springs, Mountain Springs, Ocotillo, Plaster City, El Centro, Holtville, Buttercup Valley, and Winterhaven. With the designation of Interstate 8 in 1964, U.S. 80 was phased out as segments of freeway bypassed the older U.S. 80 alignment. Many extant segments of former U.S. 80 are still in service today. 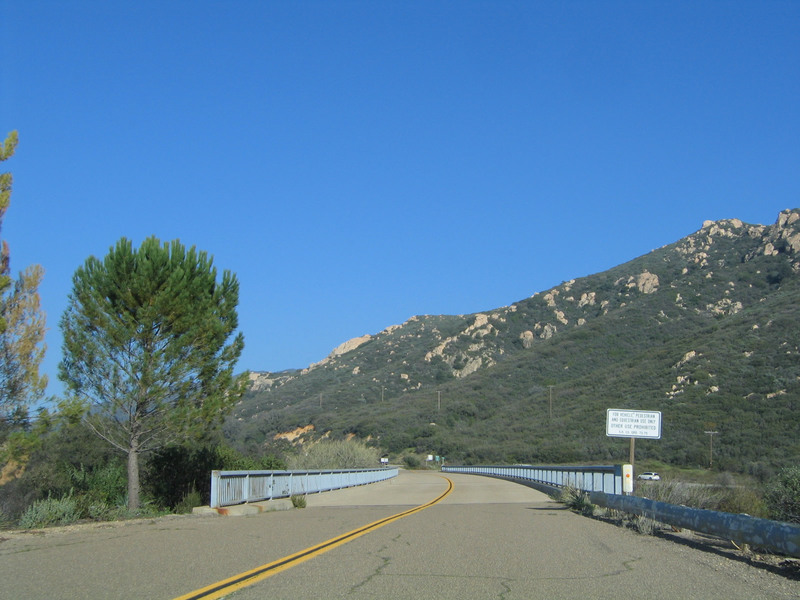 The various business loops of Interstate 8 in California (serving San Diego/La Mesa, Alpine, El Centro, and Winterhaven/Yuma) all incorporate old segments of U.S. 80. The original auto trail that preceded U.S. 80 was known as the Bankhead Highway, and that name also referred to the U.S. 80 corridor in ensuing years. Before U.S. 80 was commissioned, it was part of several auto trails that constituted an all-weather, transcontinental highway (National Southern Highway). Motorist associations formed in the 1910s to advocate for the future U.S. 80 corridor. 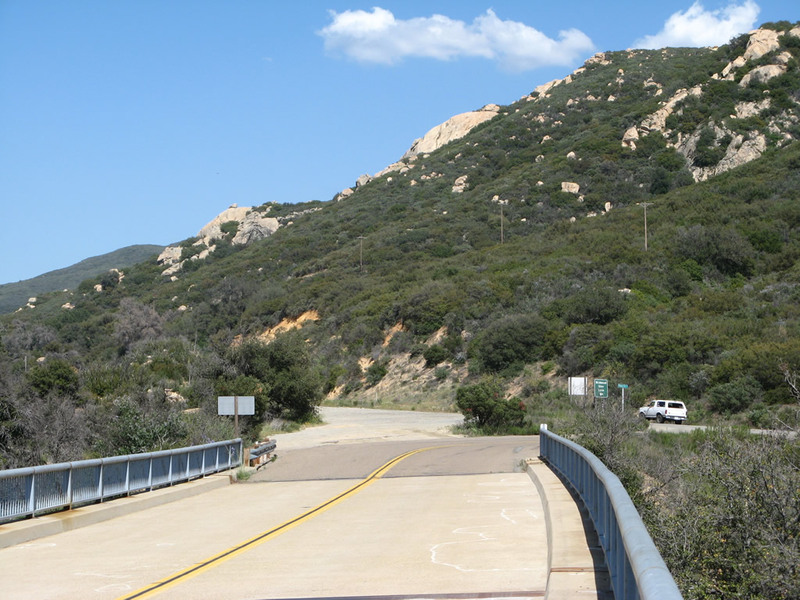 Then-future U.S. 80 in Southern California was known as part of the Ocean-to-Ocean Highway, the Bankhead Highway, the Lee Highway, the Old Spanish Trail, and the Dixie Overland Highway. 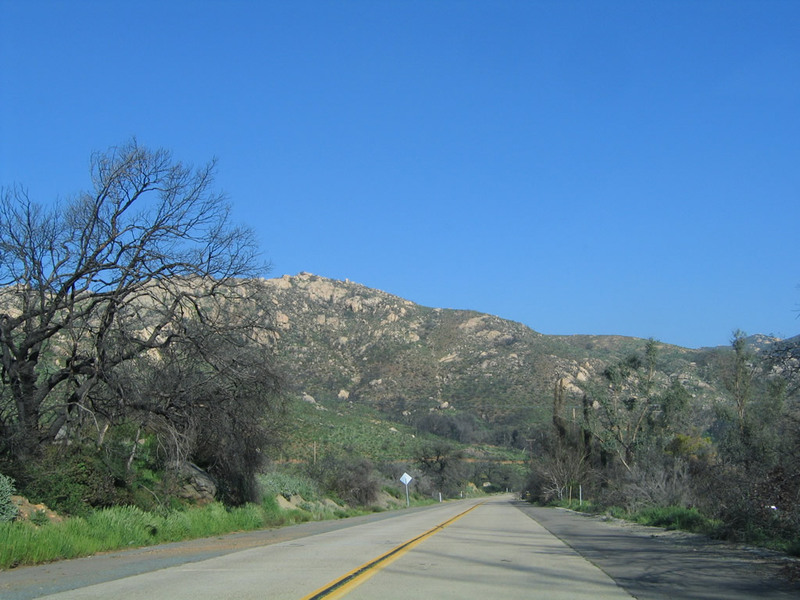 Other named auto trails, such as Jefferson Davis National Highway, followed portions of U.S. 80 (including the Laguna Mountain segment but excluding the Imperial Sand Dunes segment). In later years, U.S. 80 became known as the Broadway of America. Portions of the auto trail opened between 1911 and 1915. 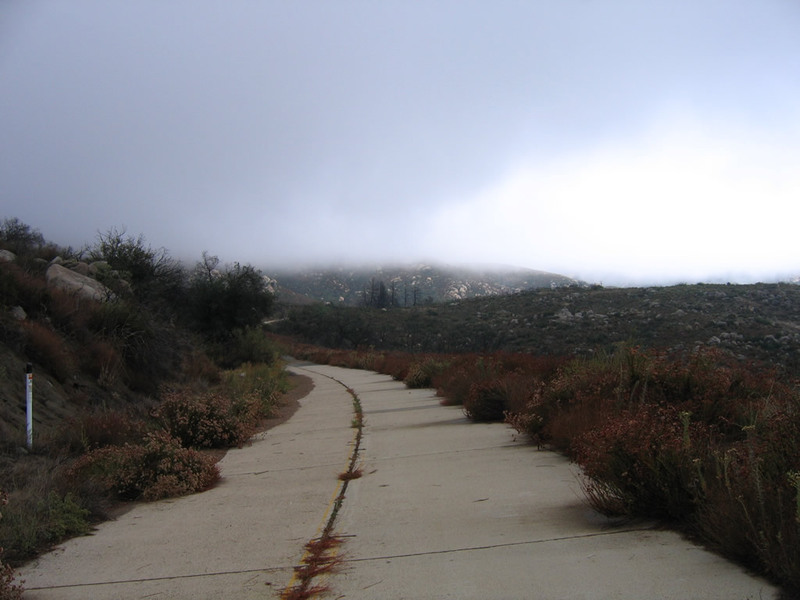 Most of the original Laguna Mountains segments opened in 1911. 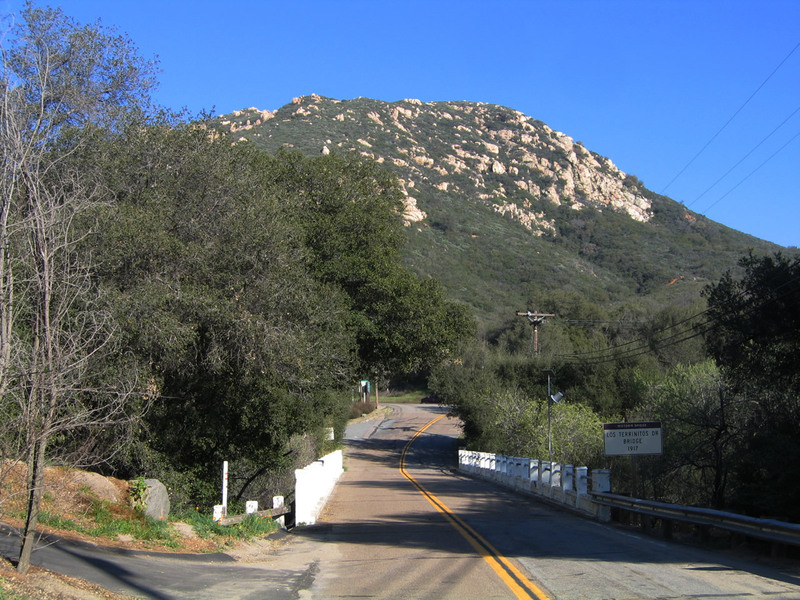 The Mountain Springs Road opened in 1913. 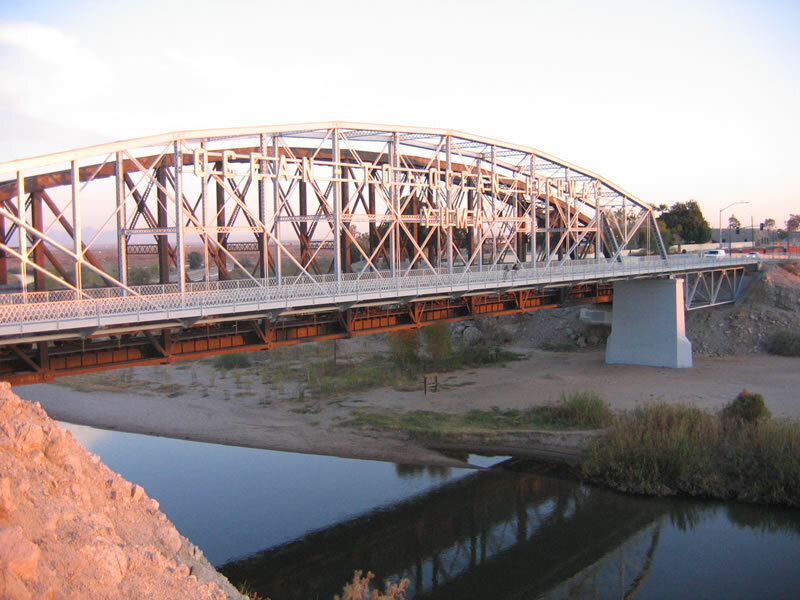 The bridge between Winterhaven and Yuma over the Colorado River opened on May 24, 1915. One of the most insurmountable obstacles was of the the Imperial (Algodones) Sand Dunes (also called the Sand Hills); the auto trail crossed over the shifting sands by way of the original, two-track Old Plank Road in 1915; a later improvement project resulted in a widened, eight-foot-wide Old Plank Road in 1916. 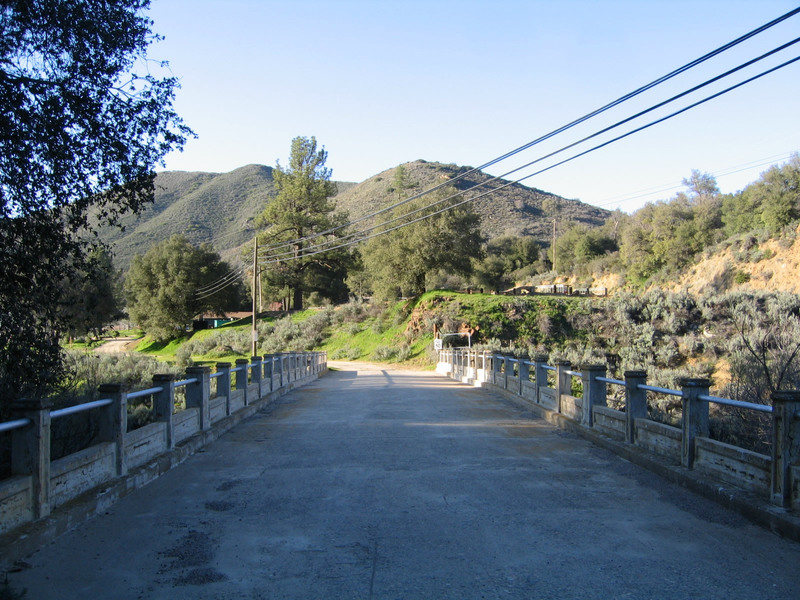 The Old Plank Road was widened again in 1922 and bypassed by a more traditional paved road in 1926.7 Around this time, U.S. 80 came into existence to replace the various auto trail designations. Replacing the auto trails along with dozens of other similarly commissioned routes as recommended by the Joint Board on Interstate Highways and approved via the American Association of State Highway Officials (AASHO), U.S. 80 was created in November 1926 and documented in April 1927 as one of the original U.S. highway routes. It originally extended across the country, connecting San Diego with Savannah, Georgia. 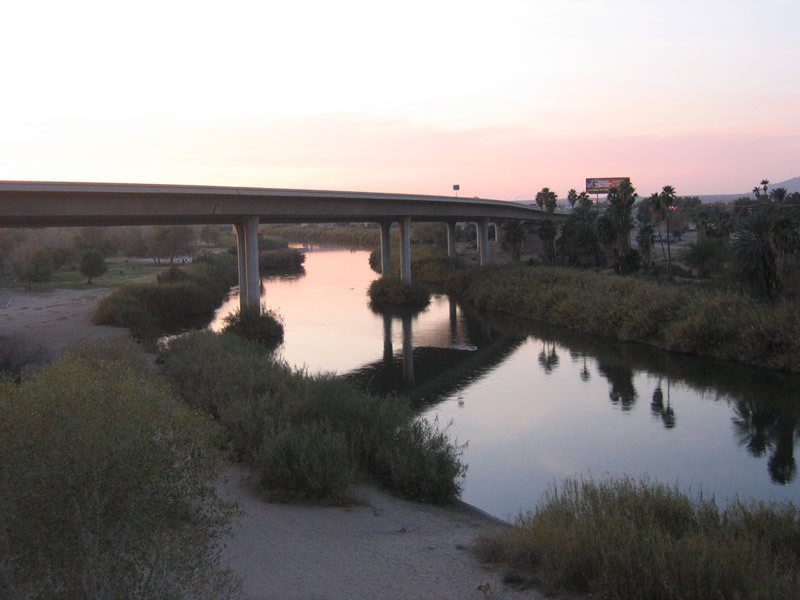 It was extended east to Tybee Island in 1929.7 In California, U.S. 80 increasingly became important and was planned for replacement by Interstate 8 between San Diego and Gila Bend, Arizona. Legislatively, the state of California decommissioned U.S. 80 in 1964. 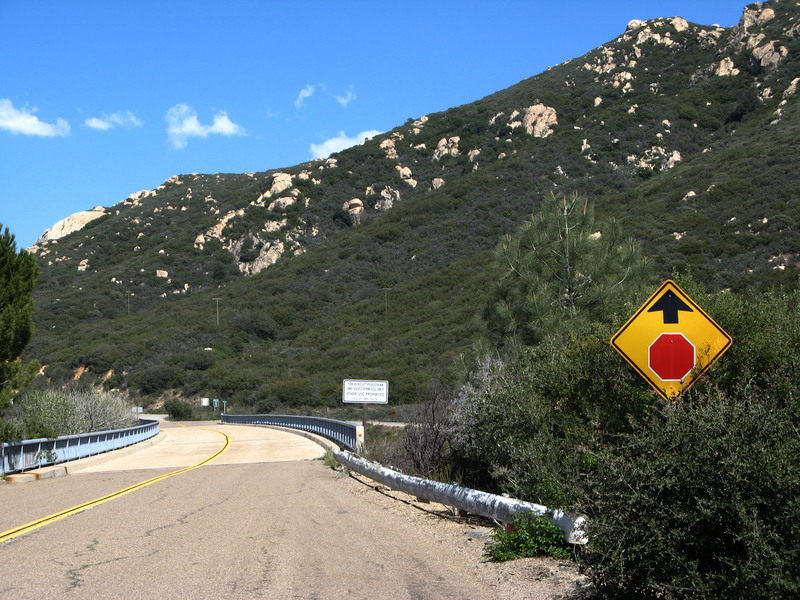 However, another decade would pass before most U.S. 80 route markers were removed from California. By 1974, most of Interstate 8 was complete and could be linked together as a continuous route across the southern tier of California, so U.S. 80 lost importance as a regional and national corridor. As sections of U.S. 80 were bypassed by Interstate 8, signs started to come down. By 1974, the last signs for U.S. 80 disappeared along the Interstate 8 corridor in California. 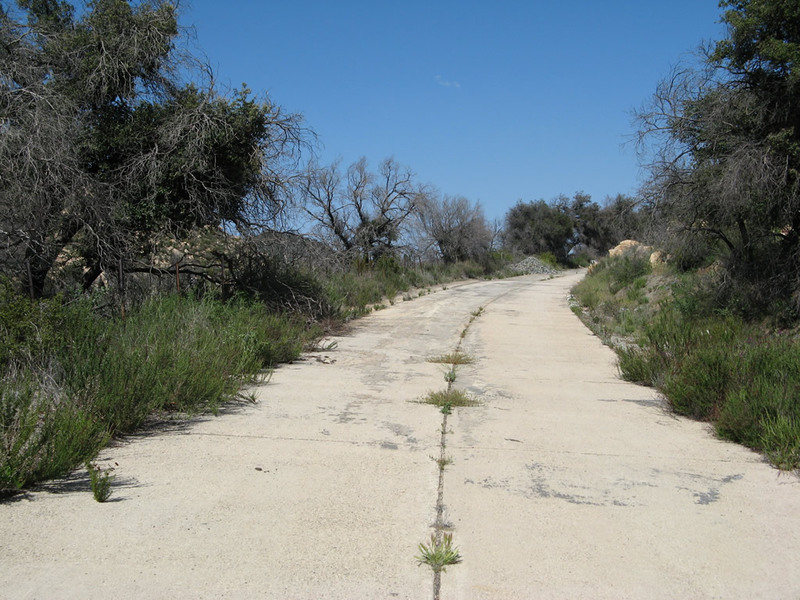 U.S. 80 still remains in use as a local road in most of San Diego County and Imperial County in Southern California. 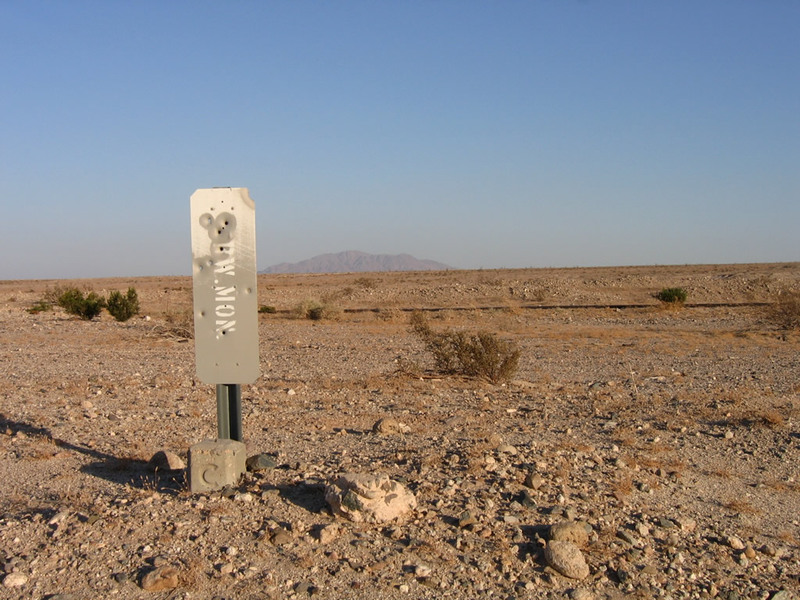 The old alignments carry names such as "Old Highway 80" and were signed with brown "Historic U.S. 80 Route" markers in October 2006. 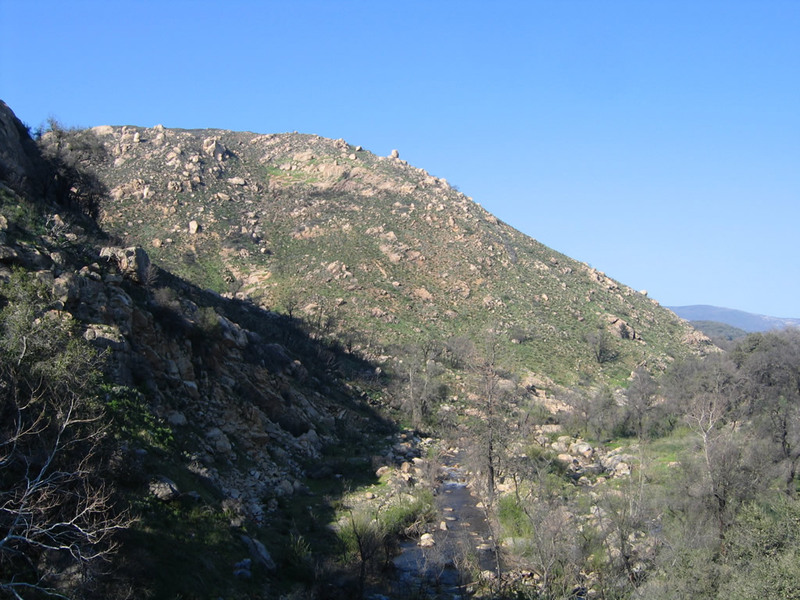 The disconnected segments, when linked together, used to be the primary route leading from San Diego on the coast with its suburbs (La Mesa, El Cajon, and Alpine) and then east into the Laguna Mountain communities of Pine Valley, Boulevard, and Jacumba Hot Springs. 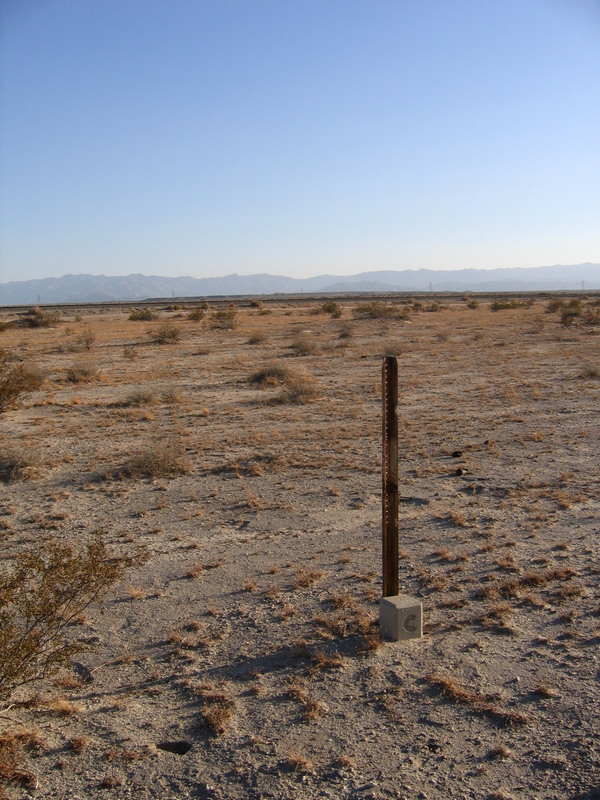 At In-Ko-Pah east of Jacumba Hot Springs, U.S. 80 descended into the Imperial Valley, with many old concrete sections still visible from Interstate 8. 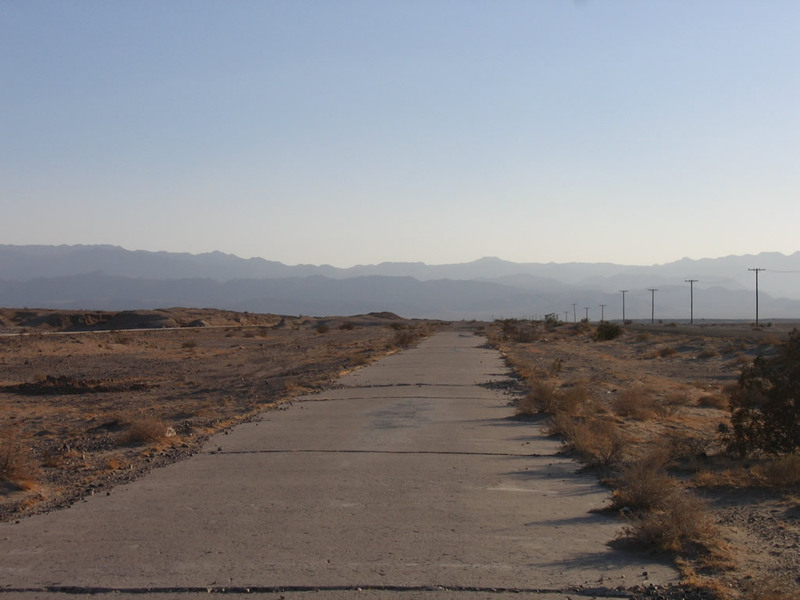 The old route then follows Imperial Cuonty Route S-80/Evan Hewes Highway east to Seeley, El Centro, and Holtville. 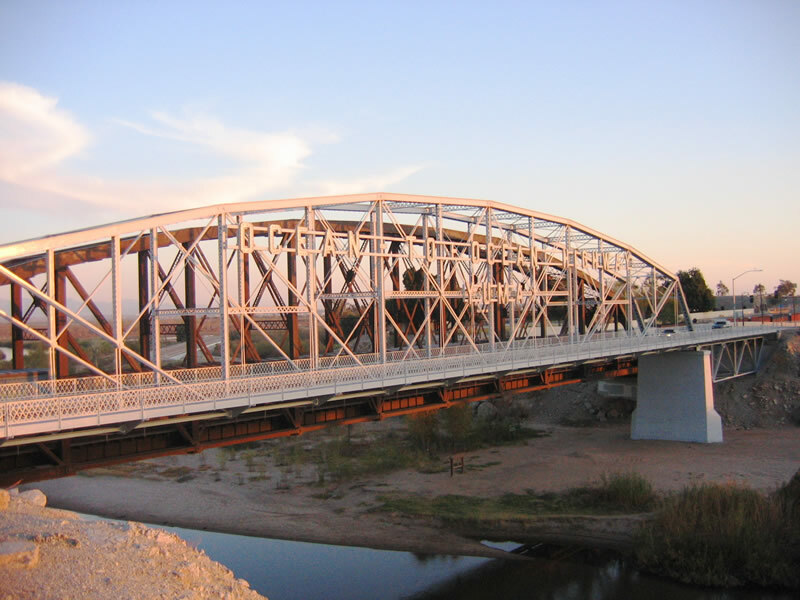 Staying just north of Interstate 8 east of Holtville and just south of Interstate 8 through the sand dunes, Old U.S. 80 crossed the Colorado River on the still-standing 1915 Ocean-to-Ocean Highway bridge and entered Arizona from the small community of Winterhaven, leading into Yuma. 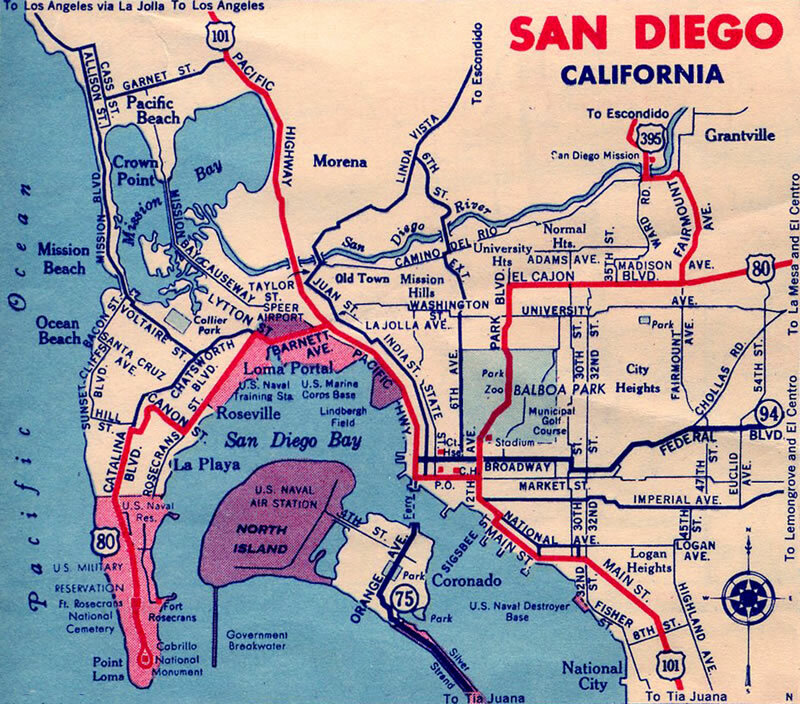 From U.S. 101/Broadway at Horton Plaza north along the 4th/5th Avenue couplet to University Avenue, then east on University Avenue to La Mesa (circa 1926-1930); a 1933 AAA map of San Diego showed the route of U.S. 80 via 5th Avenue. 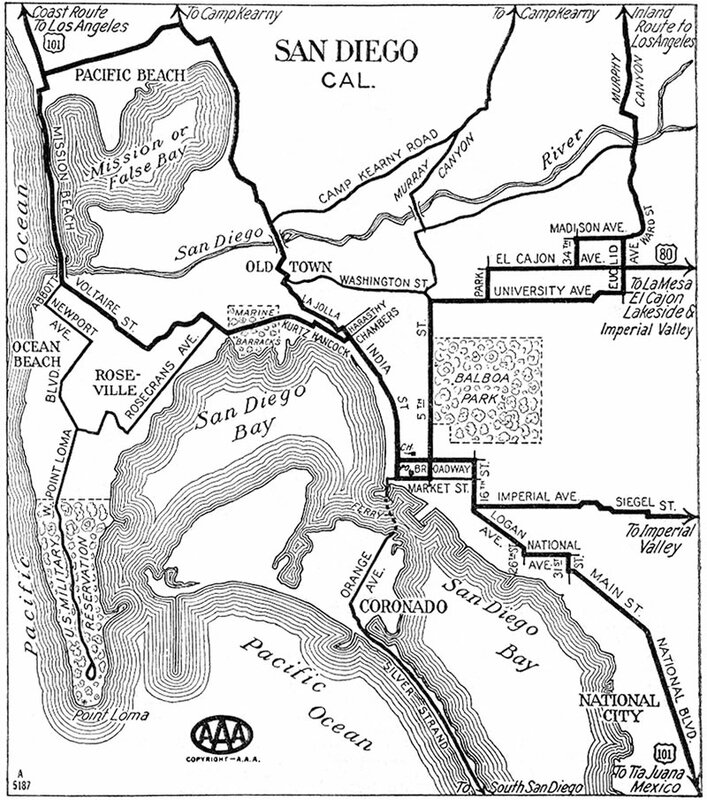 Around 1940-1943, a possible extension of U.S. 80 was to carry the route from downtown San Diego northwest along Historic U.S. 101 (Pacific Highway) to Barnett Avenue, then west along Barnett Avenue, Rosecrans Street, Canon Street, and Catalina Boulevard to end at Cabrillo National Monument near the tip of Point Loma. This extension only appeared on Gousha maps during the World War II timeframe, and it is not clear whether U.S. 80 markers were ever placed on this alignment. From Harbor Drive (Historic U.S. 101) near today&apos;s Grand Hyatt Regency hotel east along Market Street to 10th/11th Avenue couplet north to the Cabrillo Freeway then east on Washington Street, Normal Street, and El Cajon Boulevard to La Mesa (1947 to 1953). 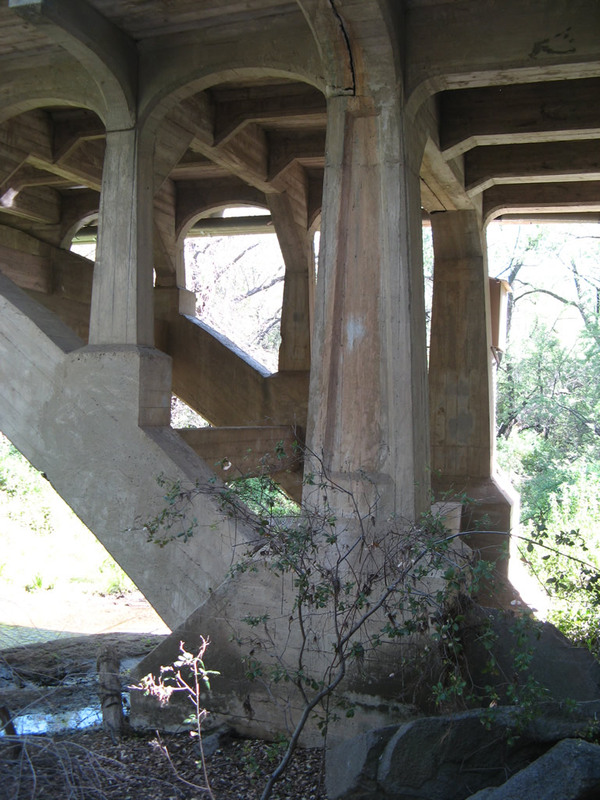 The Cabrillo Freeway was constructed between 1942 and 1947. 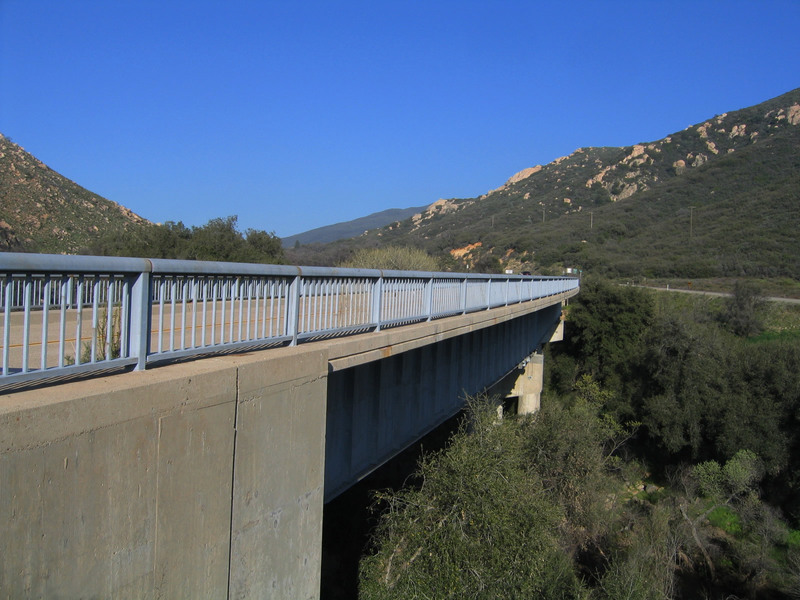 Many sections of U.S. 80 were constructed using Portland Cement Concrete, and they date back to the 1930s and earlier (in some rare cases, abandoned concrete dates back to 1917, just after the Old Plank Road and Ocean to Ocean Highway Bridge were opened to traffic in 1915). 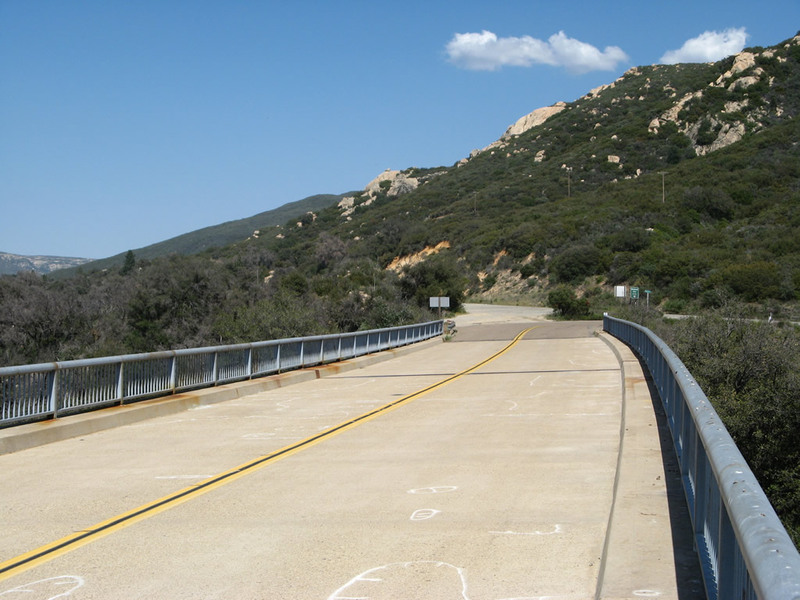 Several of these segments can be seen in San Diego and Imperial Counties as frontage roads, realigned curves, and old bridge approaches. 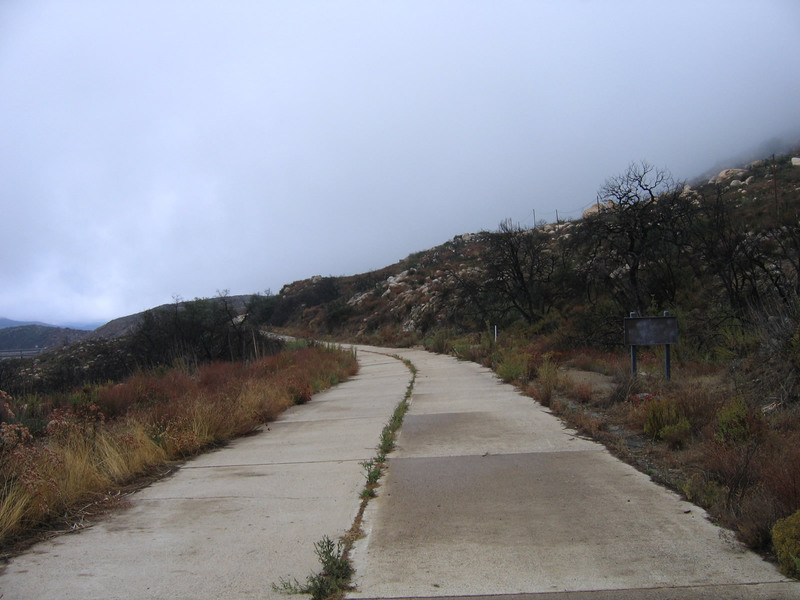 Several other segments remain in use today, especially the long stretch of Old Highway 80 in eastern San Diego County through Jacumba Hot Springs that largely dates to the 1930s. With the elimination of U.S. 80 in California by 1974, a much greater portion of U.S. 80 was later removed from the books nationally. 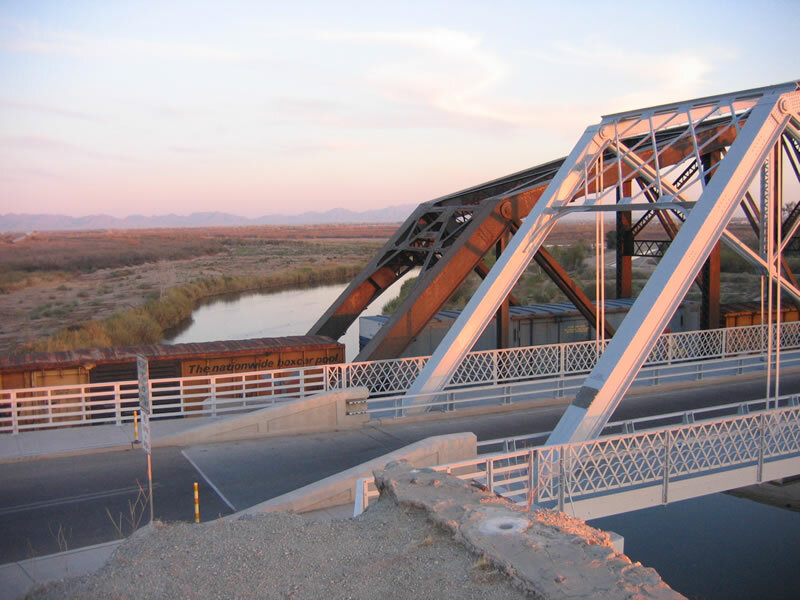 The first segment to be decommissioned was U.S. 80 in western and central Arizona, from Yuma east to Benson on September 16, 1977 (per state Resolution 1977-16-A-048). AASHTO approved U.S. 80&apos; removal between these points a little more than a month later, on October 28, 1977.4 This route was replaced by Interstate 8 (Yuma to Gila Bend), Arizona 85 (Gila Bend to Buckeye), Maricopa County 85 (Buckeye to Phoenix), Interstate 10 (Phoenix to Tempe), U.S. 60 (Tempe to Florence Junction), U.S. 89 and Arizona 79 (Florence Junction to Catalina), Arizona 77 (Catalina to Tucson), and Interstate 10 (Tucson to Benson). (U.S. 89 was decommissioned south of Flagstaff a few years later, on August 21, 1992, per state Resolution 1992-08-A-056.) Full elimination of U.S. 80 finally occurred in Arizona on December 15, 1989, when U.S. 80 from Benson to Bisbee and Douglas was replaced by Arizona 80 and New Mexico 80 (per state Resolution 1989-12-A-096). 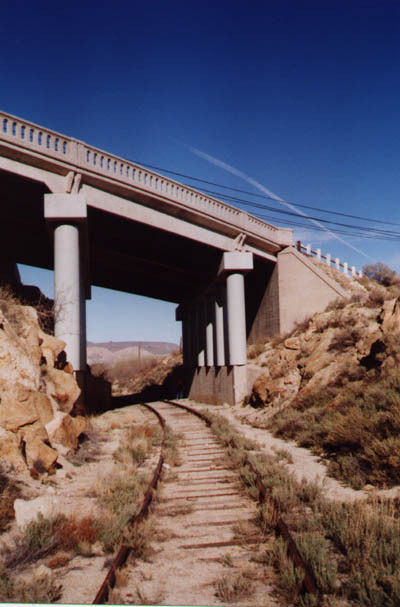 AASHTO had approved the retraction from Arizona and New Mexico on October 6, 1989 (from Benson, Arizona, east to New Mexico Route 48 in Anthony, New Mexico). 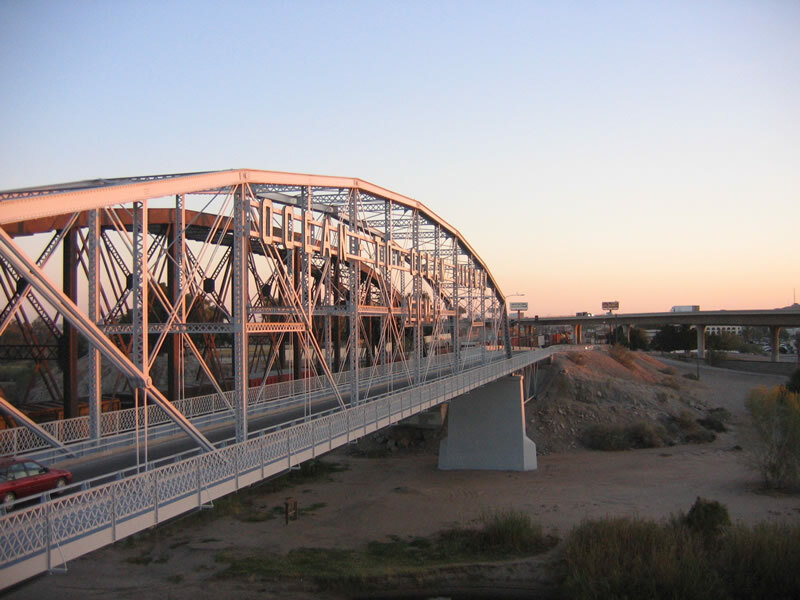 The route was removed from New Mexico at the same time, replaced by New Mexico 80 and Interstate 10 from Lordsburg to El Paso. The first planks of the road were laid on February 14, 1915, and construction continued through that winter. The Plank Road officially opened to traffic two months later on April 4, 1915, over a distance of nearly six and a half miles. The first wave of motorists to cross the Plank Road in Spring 1915 was the "Glad Hand Excursion," which included 25 cars and approximately 100 people. The road was built initially as a two-track: Cars were to drive over the original Plank Road with each wheel on a pair of narrow, two-foot, one-inch wide planks laid side-by-side. Only one direction of traffic could proceed across the dunes at a time. 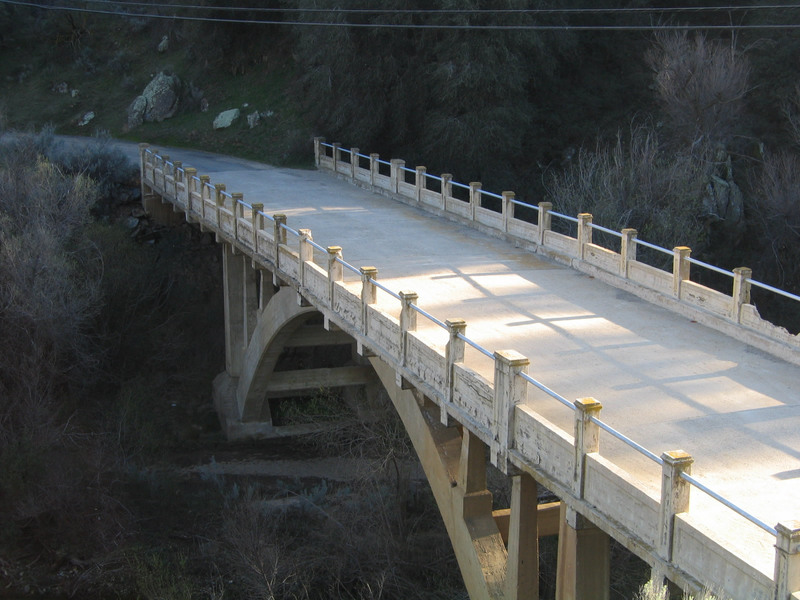 Despite the limitations of the design, the Plank Road enabled road travel never conceived previously. 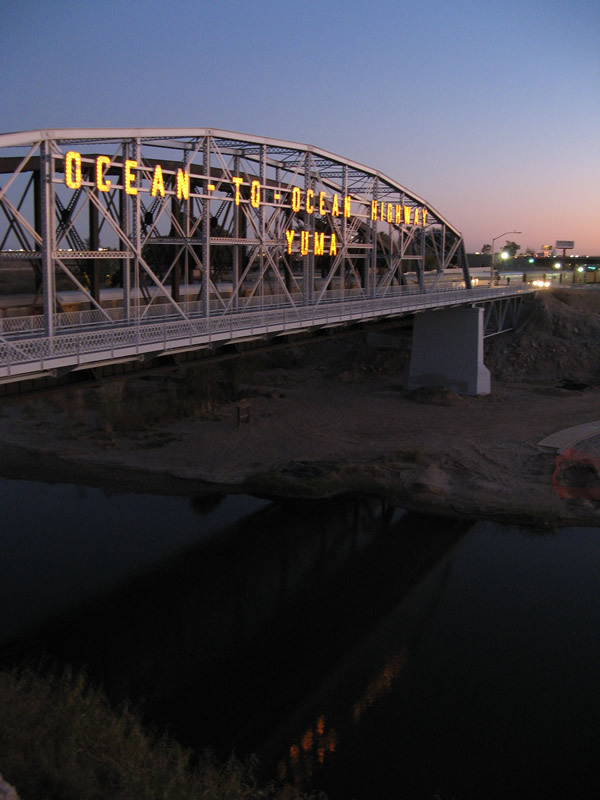 With the opening of both the Plank Road and the Ocean to Ocean Highway bridge over the Colorado River between Yuma and Winterhaven in 1915, a true transcontinental automobile route was finally possible across the southern tier of the United States. The Plank Road became a state highway in June 1915. In 1916, the state rebuilt the Plank Road with wooden cross ties laid to a width of eight feet with double-width turnouts every 1,000 feet. Maintenance was difficult due to wind-blown sand, shifting sand dunes, rough rides due to plank movement, and traffic jams due to the need to pull off to a turnout to allow opposing traffic to pass. Despite efforts to create a two-way plank road in 1924, it became clear that a permanent, paved road would be the best long-term solution for crossing the sand dunes. To that end, engineers determined that lower sand dunes moved rapidly, while other higher dunes moved more slowly. This meant that a road at a higher grade could be feasible. 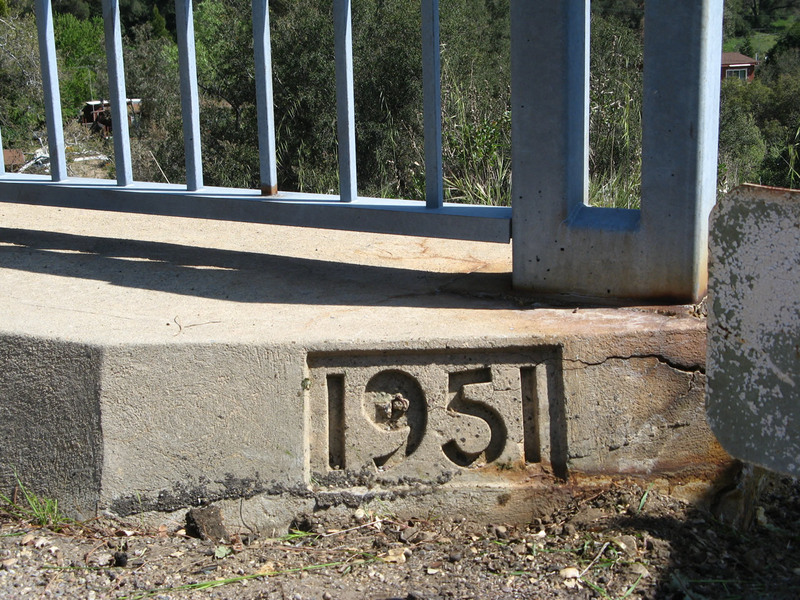 To that end, a new paved road opened on August 12, 1926, to replace the Plank Road. 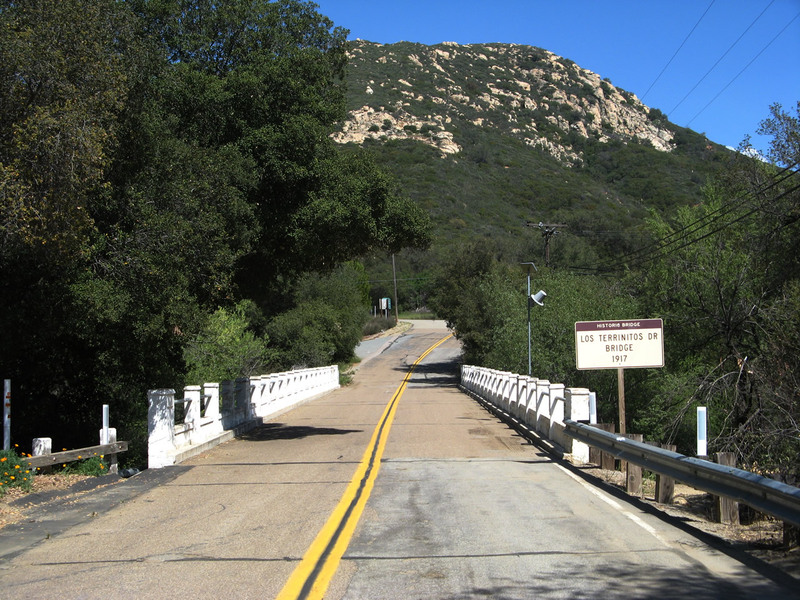 While the Plank Road was never signed as U.S. 80, it plays a major role in the history of the cross country route and today is a California State Historical Landmark. 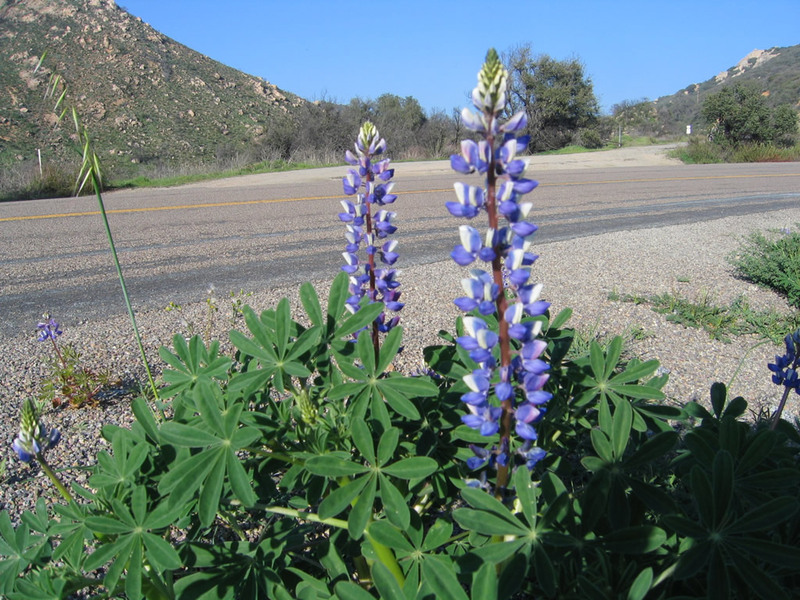 The paved road is now a frontage road along the four-lane Interstate 8 freeway, which was also built to withstand the challenges of the shifting sand and desert environment. Many thanks to the San Diego Automotive Museum for information about the Old Plank Road. A visit to the museum is a must for any old road or car enthusiast. 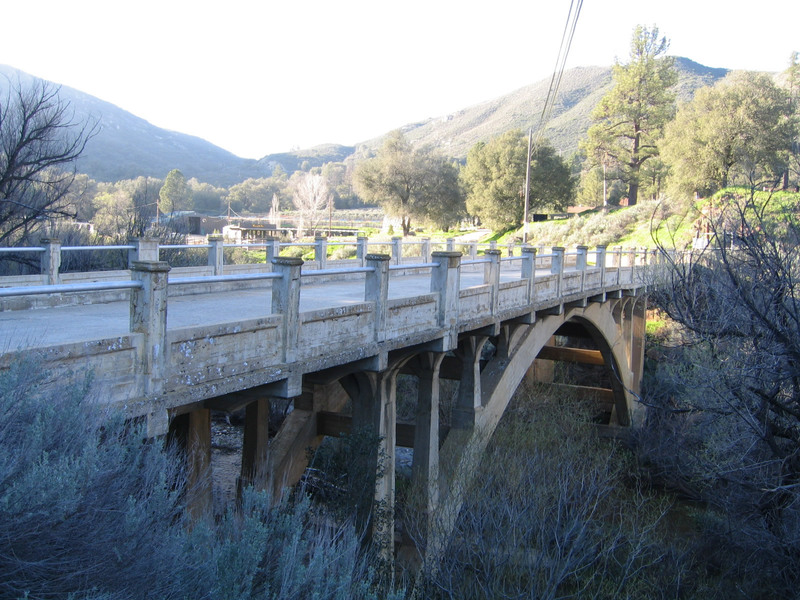 Additional information comes from archived copies of the California Highways and Public Works magazine and Desert U.S.A. - Old Plank Road webpage. 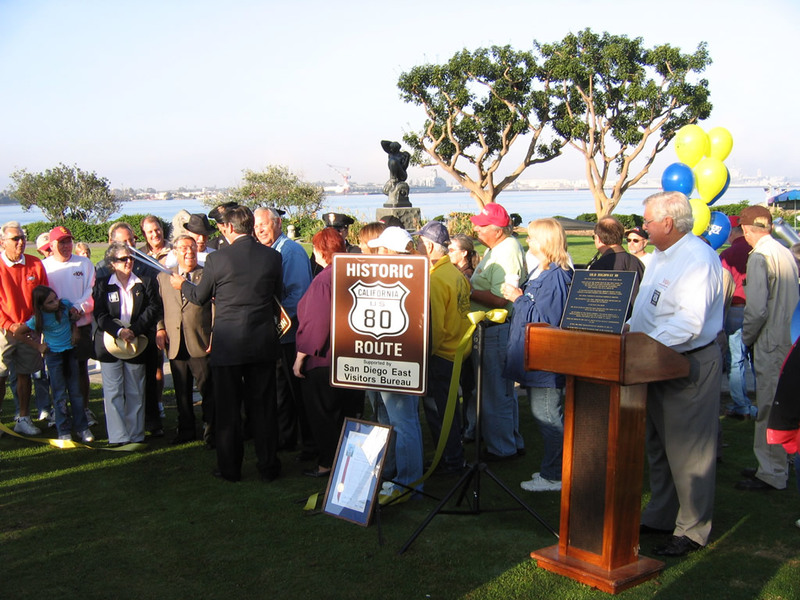 On October 21, 2006, a ceremony was held in Seaport Village to celebrate the designation of the old alignment of U.S. 80 in San Diego County as a historic route. This plaque was commissioned at the event. It states, "You now stand at the end of a very long road. Born out of the muddy ruts of the first model T&apos;s, a 3,000-mile dream against insurmountable odds to connect east and west by automobile. They would call it U.S. Route 80. It spanned rugged mountains, bridged mighty rivers, crossed scorching deserts, and linked a growing nation. But what started in Savannah stopped in Phoenix. 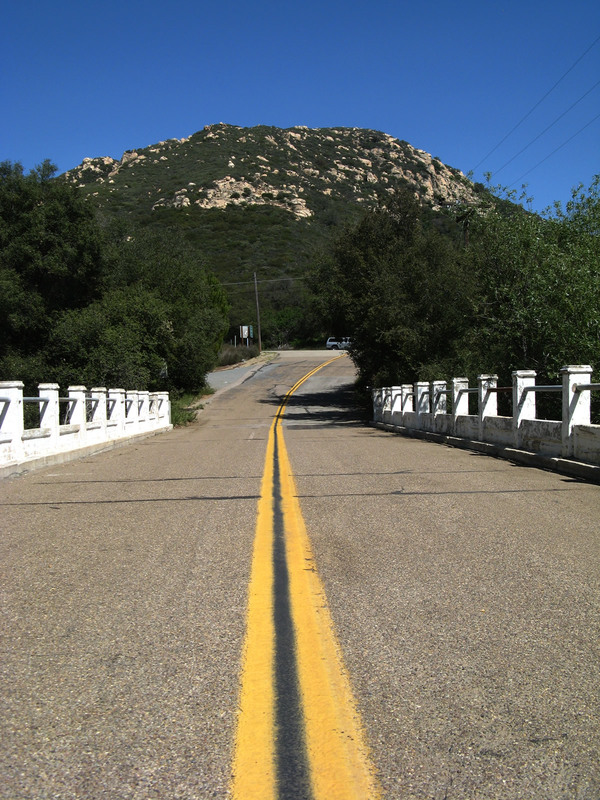 The roadblock was this: Should the final destination be Los Angeles or San Diego? A car race was held. The team to reach Phoenix first would win for their city, the final leg of the highway. On October 28, 1912, David Campbell and Edgar Harvey, in a Stevens-Duryea Racer, reached the finish line in just under 17 hours, two hours ahead of their L.A. rival. With San Diego on the map, U.S. Route 80 was finally commissioned in 1926. 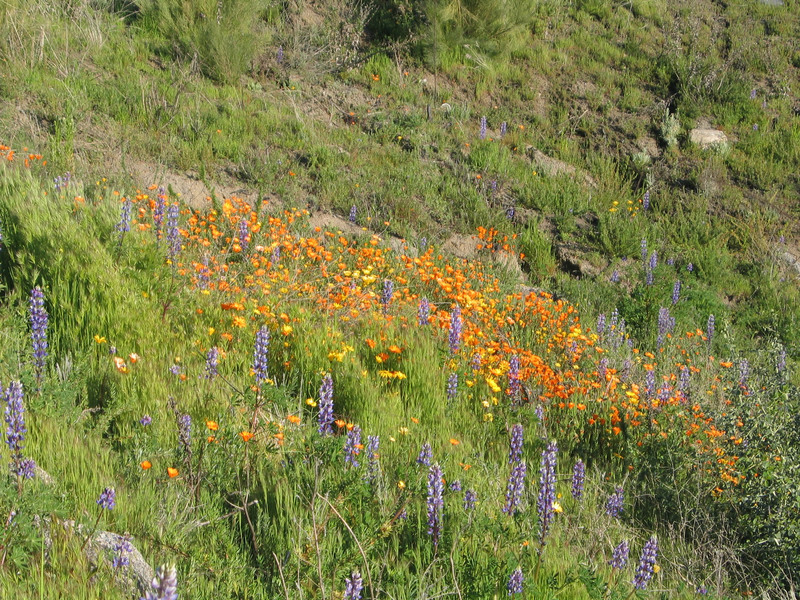 It was the first transcontinental highway in the U.S. 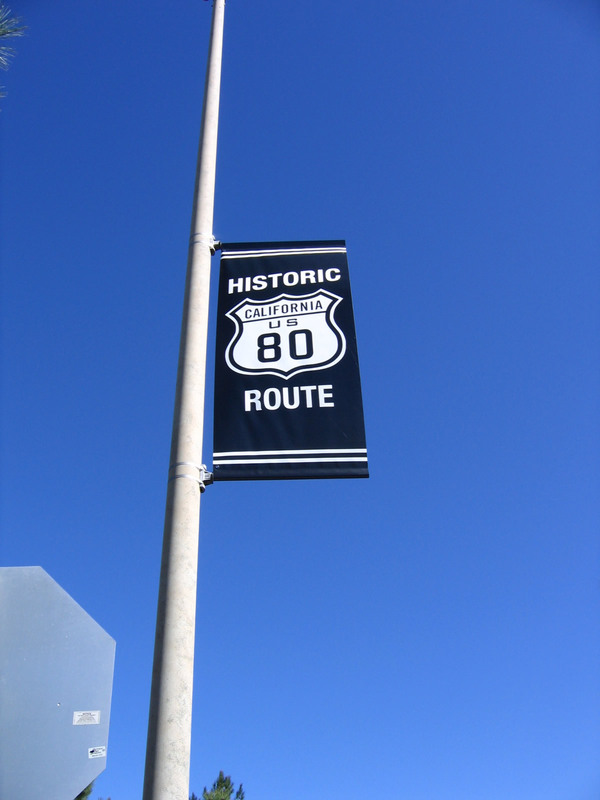 In years since, U.S. Route 80 would come to be called the 'Broadway of America.'" The current specific location of this plaque is not known but is likely to reside in the Automotive Museum in Balboa Park. Photo taken 10/21/06. 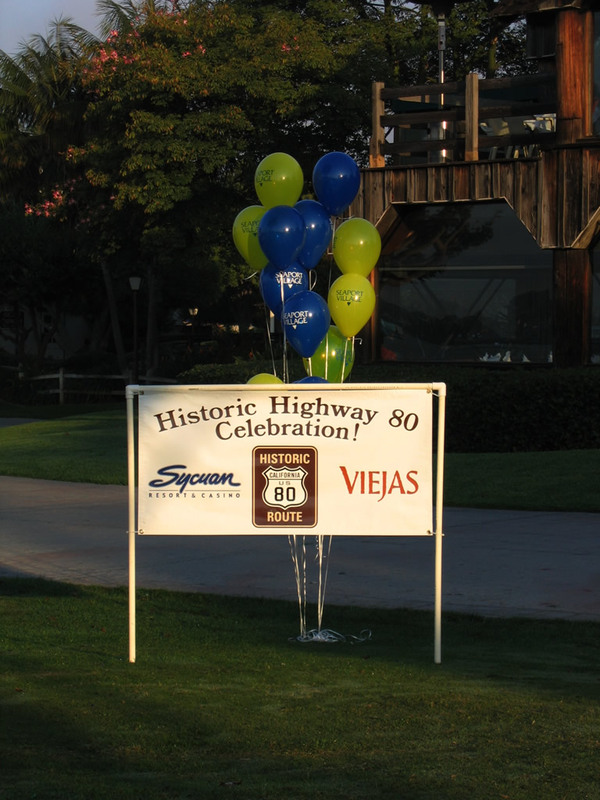 This celebratory sign for the October 21, 2006, ribbon-cutting ceremony for Historic U.S. 80 was posted in Seaport Village. The ceremony was held just south of the Harbor House at the Unified Port of San Diego&apos;s Embarcadero Marina Park North in the morning, and live coverage was provided on television by local station KUSI-TV Channel 9/51 and on-air personality Dave Scott. The planned festivities included a classic car rally that would follow Old U.S. 80 from Seaport Village to Viejas Casino. Photo taken 10/21/06. Following a standard set forth for other Historic U.S. 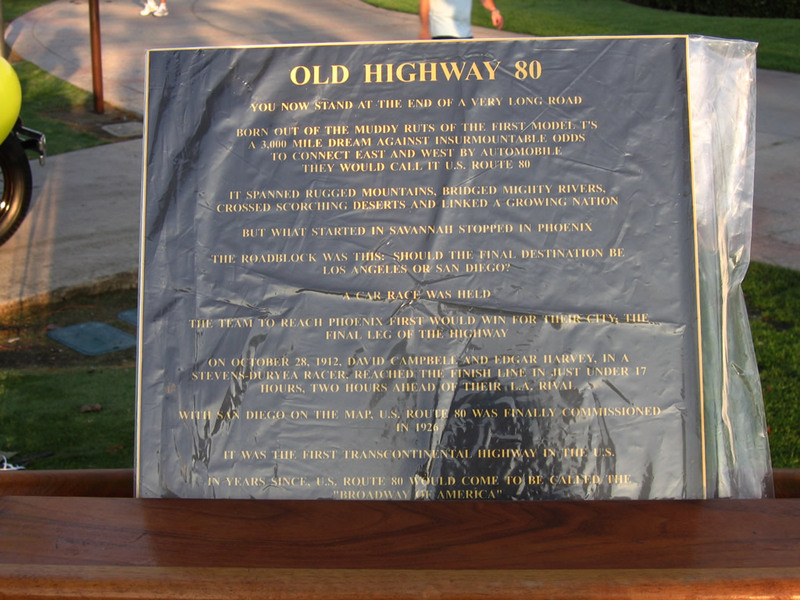 Highways (and seen on portions of Historic U.S. 6, U.S. 66, and U.S. 99 in other parts of the state), a new brown and white historic marker for U.S. 80 was posted for the first time in 2006. 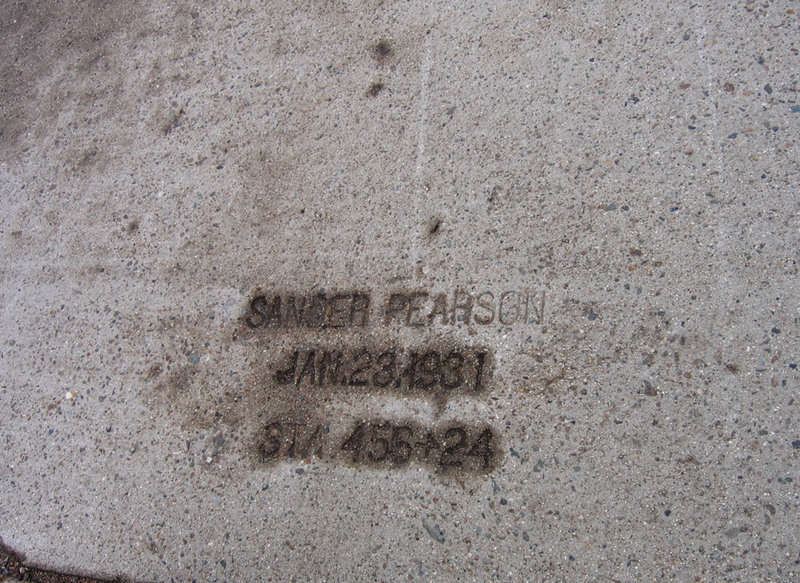 A prototype marker was also publicized at the dedication ceremony. Photo taken 10/21/06. A fair number of people, including local media and elected officials, attending the ribbon cutting of the new historic highway designation in Seaport Village/Embarcadero Marina Park North. 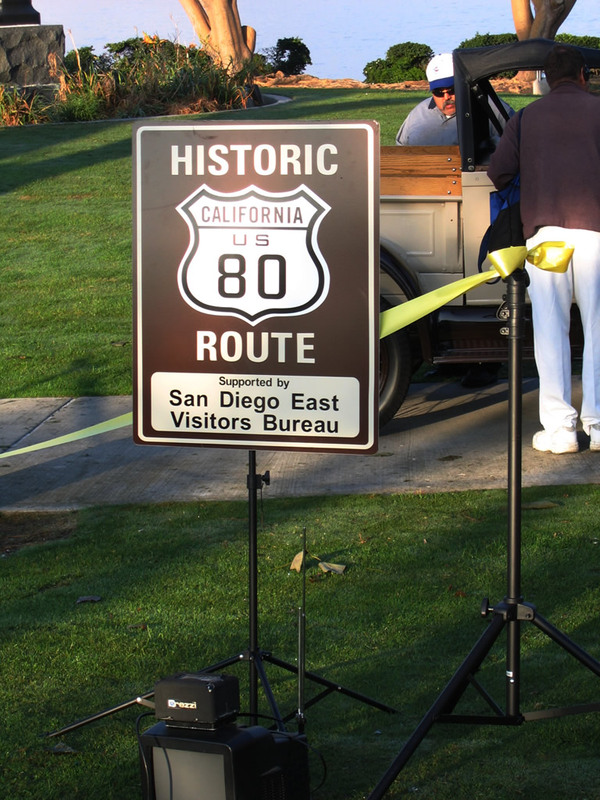 Both the plaque and prototype Historic U.S. 80 Route sign were prominently featured as various dignitaries remarked about the importance of U.S. 80 and the possible economic benefits of signing the historic route through the cities of San Diego, La Mesa, and El Cajon as well as the various unincorporated communities (such as Flinn Springs, Alpine, Descanso, Pine Valley, Boulevard, and Jacumba Hot Springs) along its mostly rural route in eastern San Diego County. Photo taken 10/21/06. 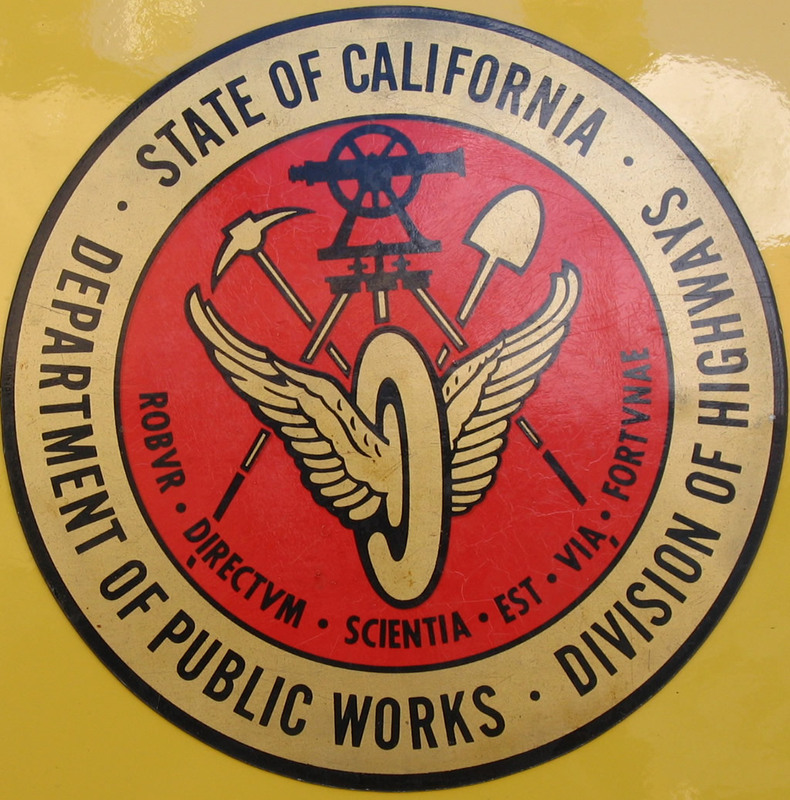 A classic car shown at the celebration had the original California Division of Highways logo painted on its side. Photo taken 10/21/06. A mural harkening back to the old days of Highway 80 is on the side of the Bekins Building at 3727 El Cajon Boulevard in the City Heights community of San Diego. 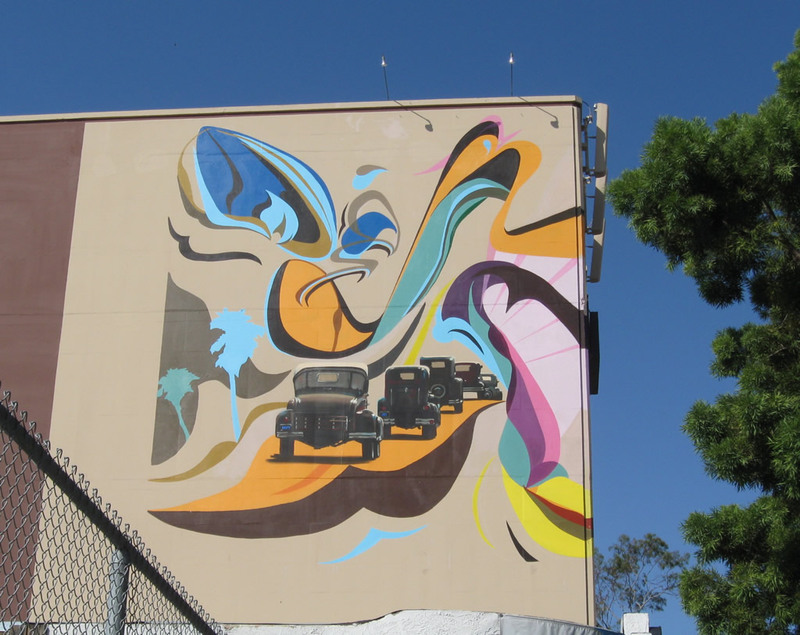 It was painted in the span of week in early December 2009 by artists Werc Alvarez and Geraldine Lozano. The mural extends around to the front of the building; this view is looking west from the southern sidewalk along El Cajon Boulevard. Photo taken 10/11/10. 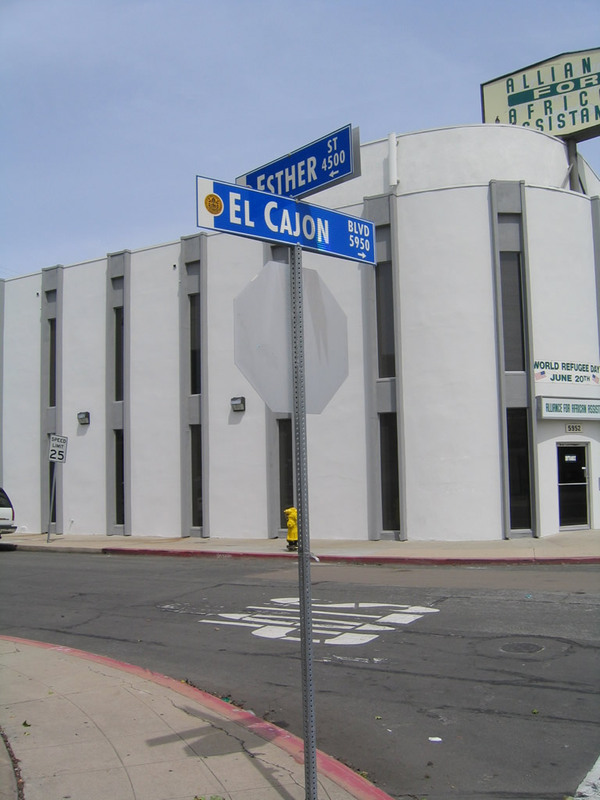 This blue and white style of street sign marks the intersection of El Cajon Boulevard and Esther Street in San Diego. These signs are being phased in across the city of San Diego through 2020, replacing older black-on-white and white-on-green signs. Photo taken 03/27/05. 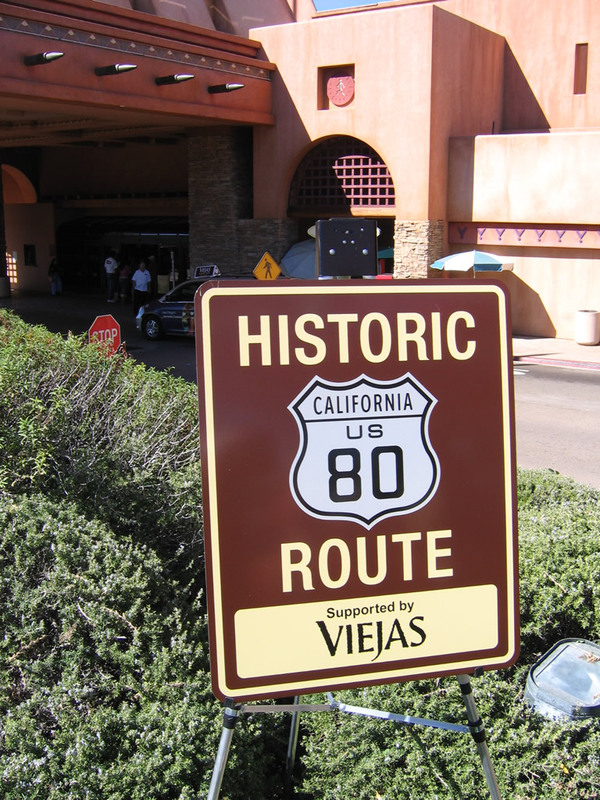 A Historic U.S. 80 sign was posted near the main entrance to Viejas Casino at the official dedication ceremony for the historic route. A series of black and white historic route banners were also posted on nearby light posts. Photos taken 10/21/06. 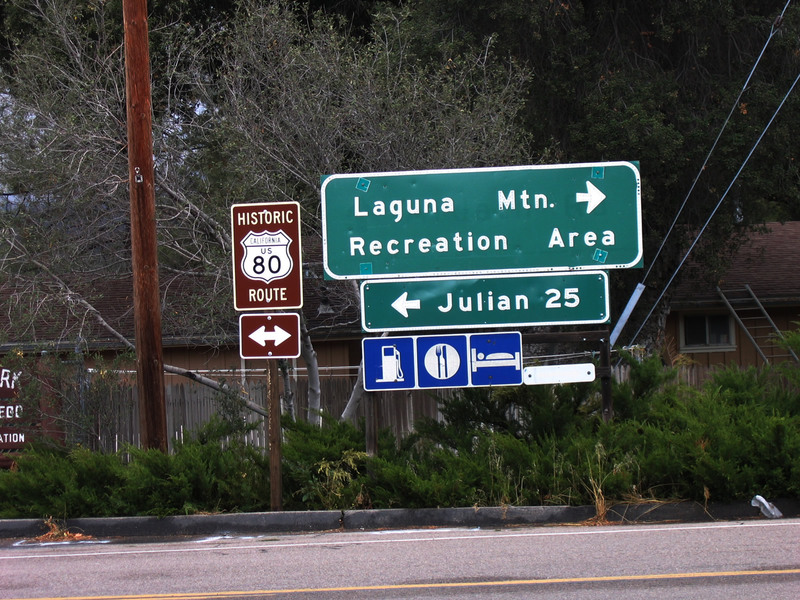 This sign, which points the way to Julian via Historic U.S. 80 west and Mt. 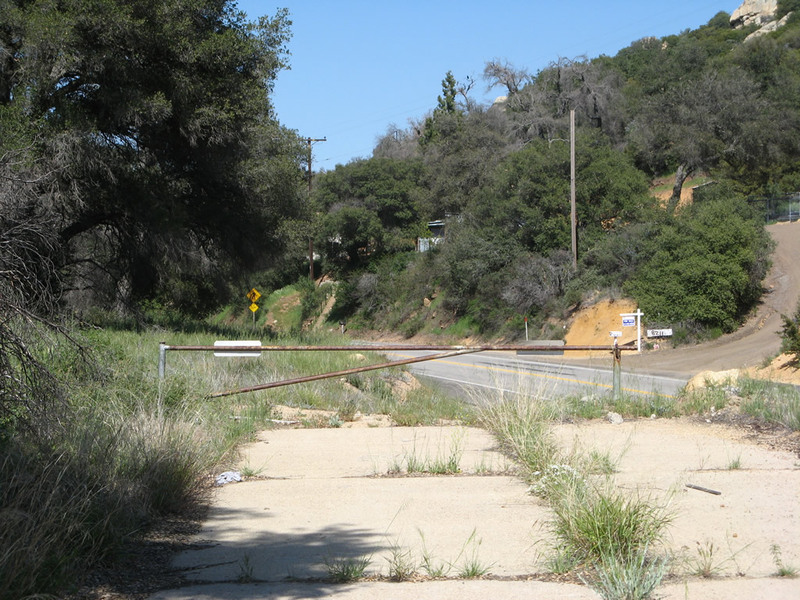 Laguna via Historic U.S. 80 east, is posted along northbound Pine Valley Road in the unincorporated community of Pine Valley. Photo taken 10/14/06. 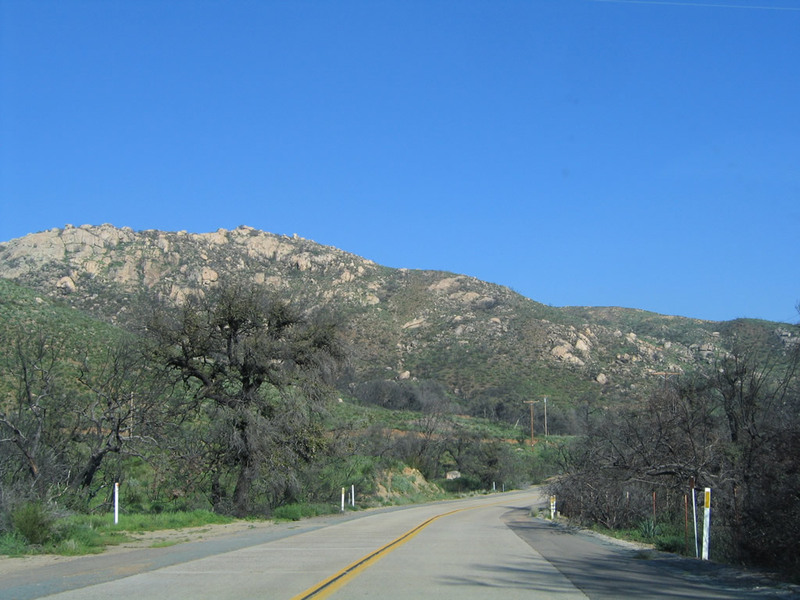 This view looks northwest toward Laguna Summit as seen from the shoulder of Buckman Springs Road (San Diego County S-1). 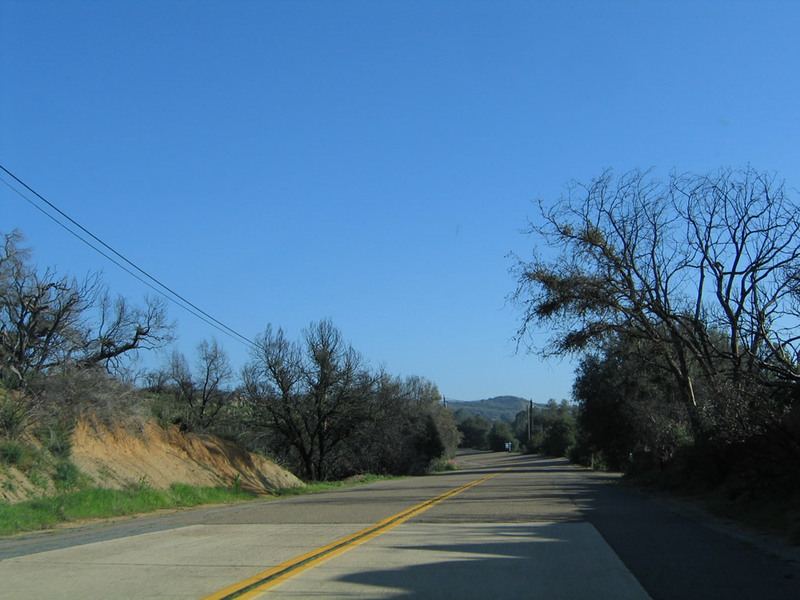 Old Highway 80 follows the power lines northwest toward Laguna Summit. Photo taken 11/10/12. 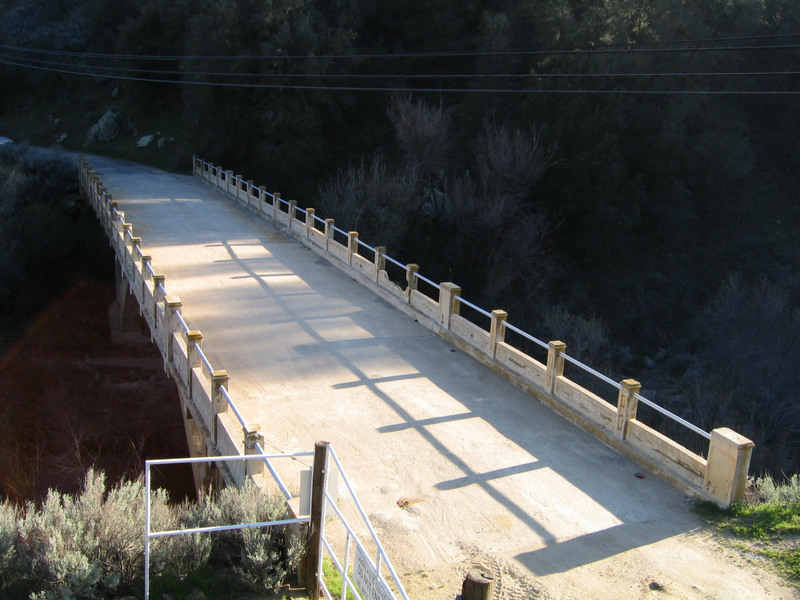 View of a bridge near Jacumba Hot Springs along old U.S. 80 in San Diego County as the highway passes over the San Diego and Imperial Valley Railroad. 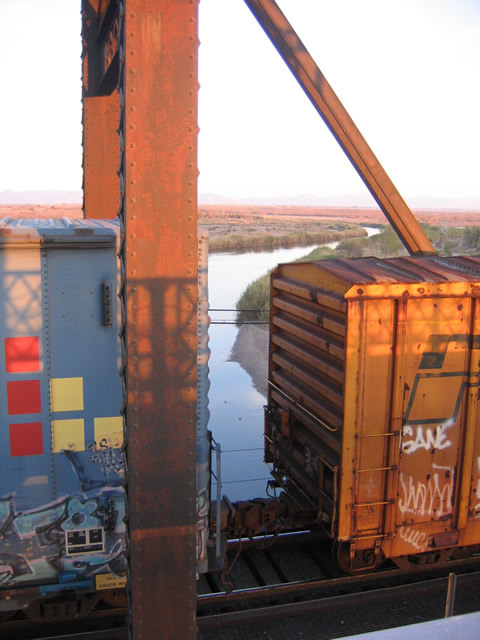 This railroad was in use as a freight line until around 1986; since then, the section between Campo and Plaster City has fallen into disuse. Plans call for this rail line to be refurbished and restored, but it is unclear when it might return to active service again. 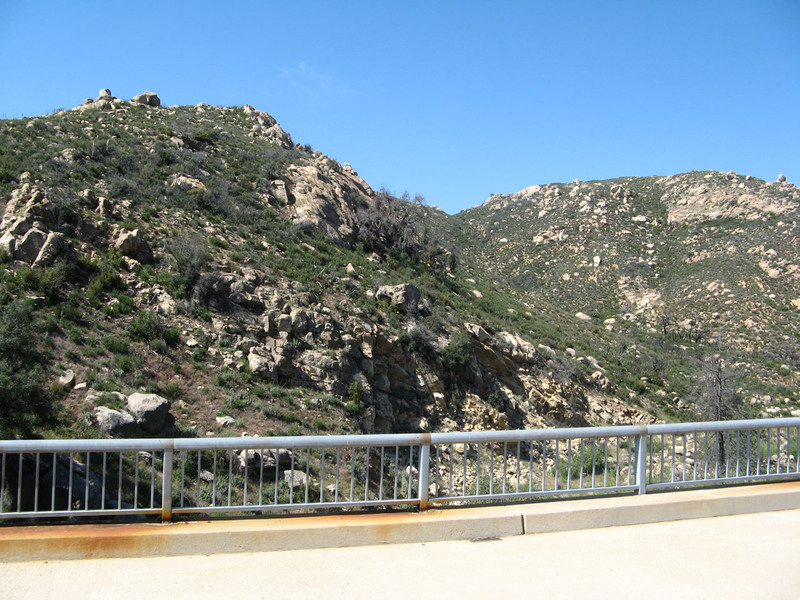 With steep grades, only a single track, and the section that enters into Mexico, this rail line is not likely to achieve the same level of traffic as many east-west railroads in California. Photo taken 01/22/99. The U.S.-Mexico International Border in metropolitan San Diego is marked with a tall fence, one that is heavily guarded and difficult to surmount. 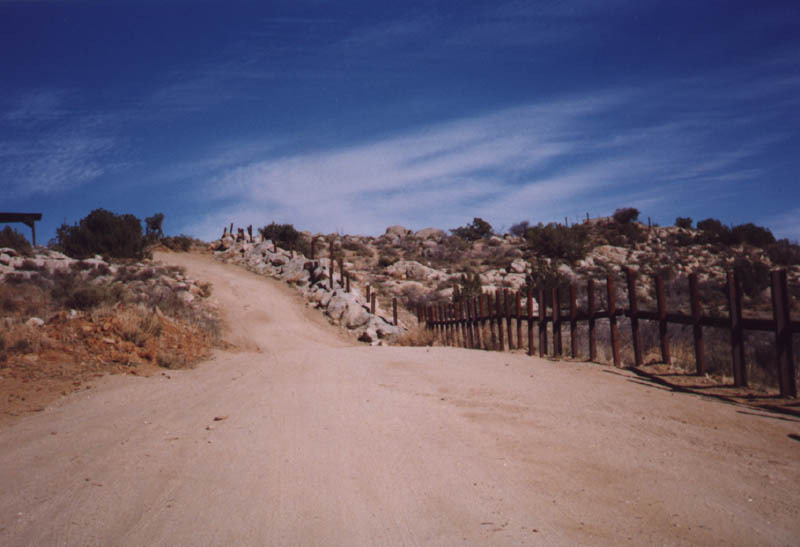 This fence was extended east through rural San Diego County in phases through the 2000s. 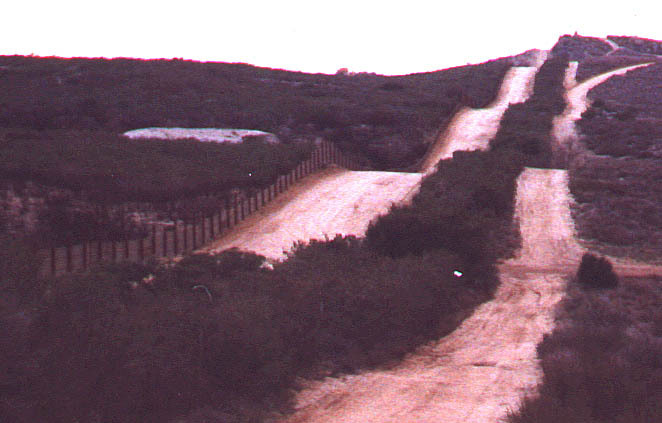 Back in 1999, however, the international border was previously marked by a short fence, paralleled by the dirt road shown in these pictures. 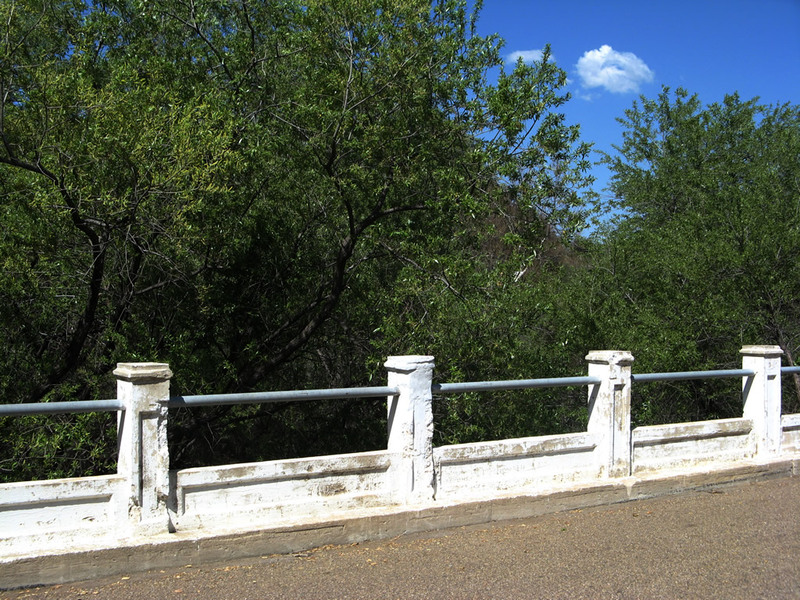 The vantage point is just south of U.S. 80 (Old Highway 80) near the railroad bridge west of Jacumba Hot Springs; the border is within walking distance from the south side of U.S. 80. Obviously, this area has changed with the installation of the taller fence. The first picture is looking west; the second picture is looking east. Photos taken 01/22/99. This sign is not located on Historic U.S. 80 itself, but it is located along a dirt road parallel to the U.S.-Mexico Border just south of the above railroad bridge near old U.S. 80. In Spanish, it says, "Caution! Don't expose your life to the elements. It&apos; not worth the penalty." 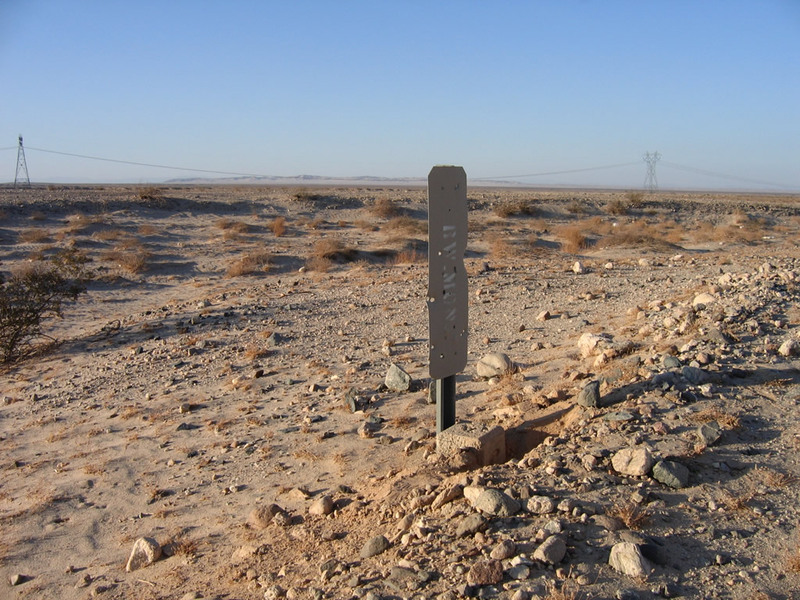 The sign is meant for migrants who are occasionally found wandering the desert malnourished after they have been dropped off by smugglers on the U.S. side of the international border. Sadly, many migrants perish before finding adequate water, shelter, or food in the harsh desert environment. Photos taken 01/22/99. Northbound Bowker Road ends at Imperial County S-80 (Evan Hewes Highway/Historic U.S. 80) at this intersection near El Centro. Photo taken 03/26/06. 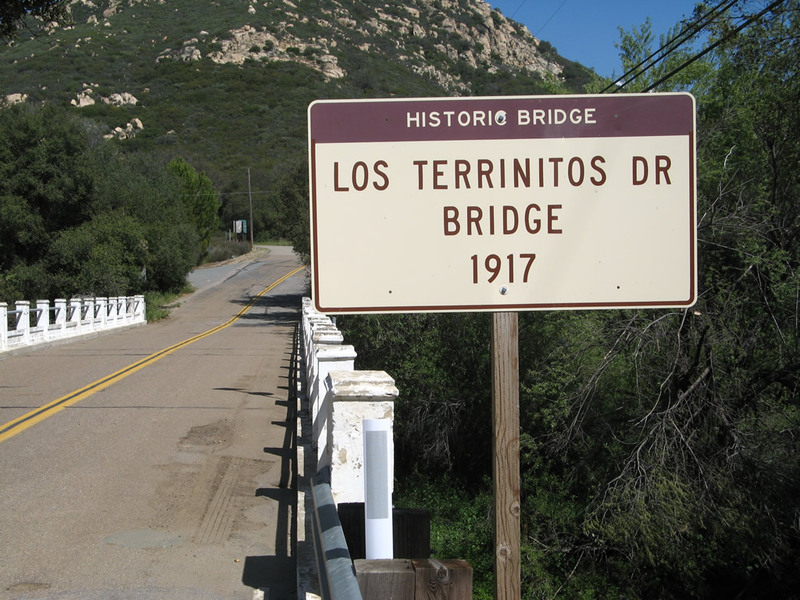 A side trip off California 79 onto Los Terrinitos Road reveals a rare, 1917 bridge that originally served the pre-U.S. 80 auto trail and later was incorporated into U.S. 80. 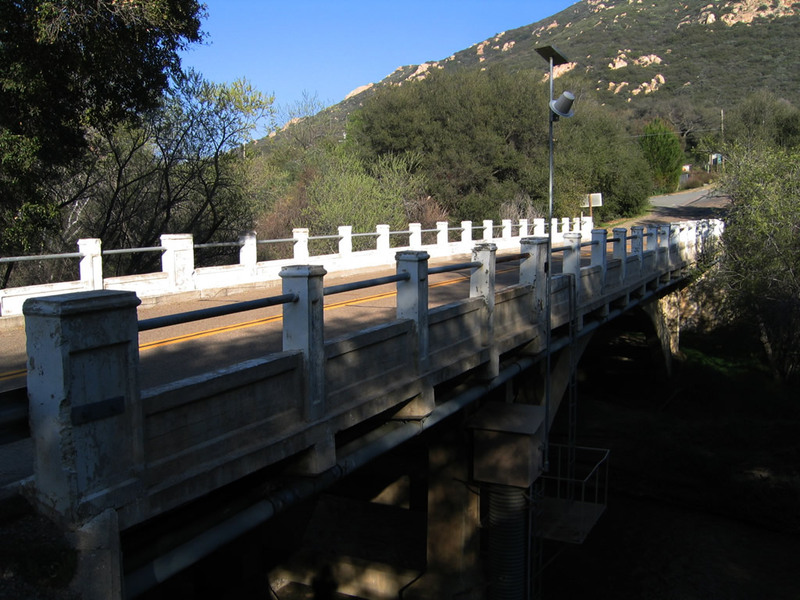 This narrow, ornate bridge served as part of the principal east-west U.S. 80 route until 1951, when the taller, wider 1951 bridge was built along what is now Wildwood Glen Lane. 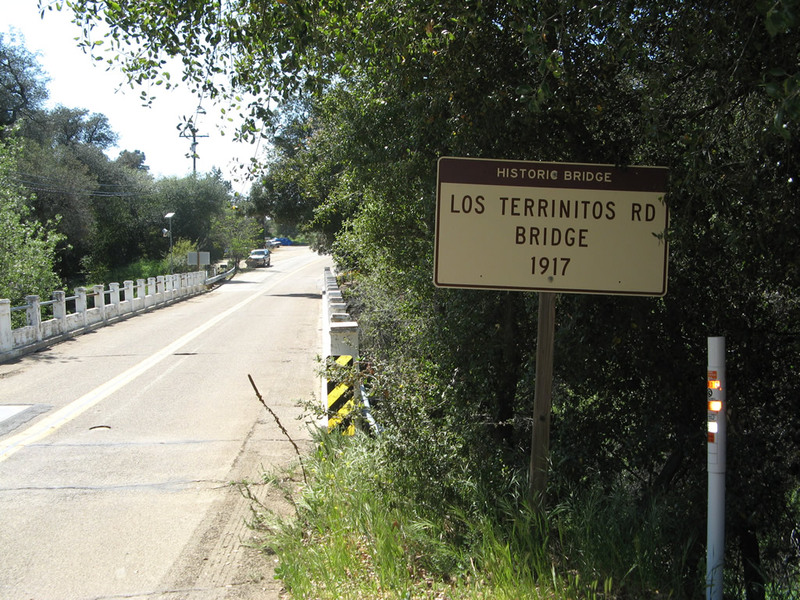 Los Terrinitos Bridge is a deck concrete arch bridge that spans the Sweetwater River. 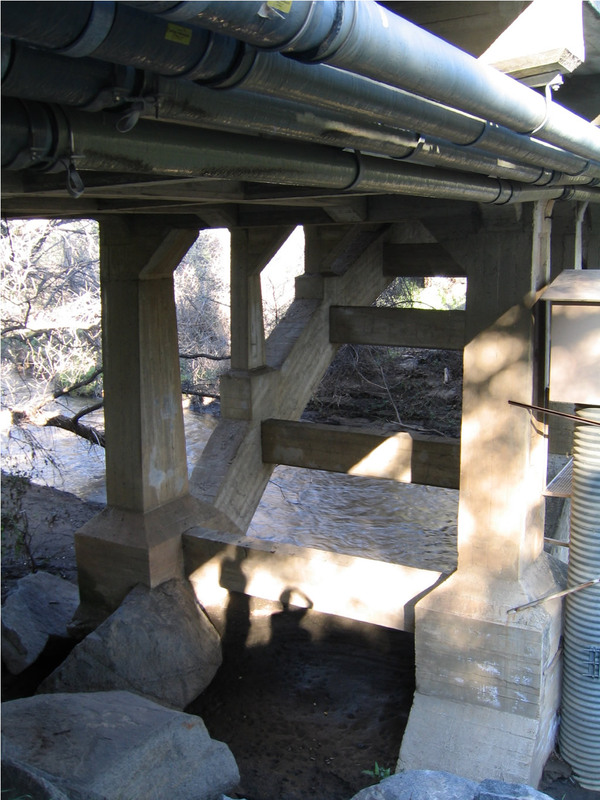 These pictures also show the underside of the bridge with its cathderal-like substructure. 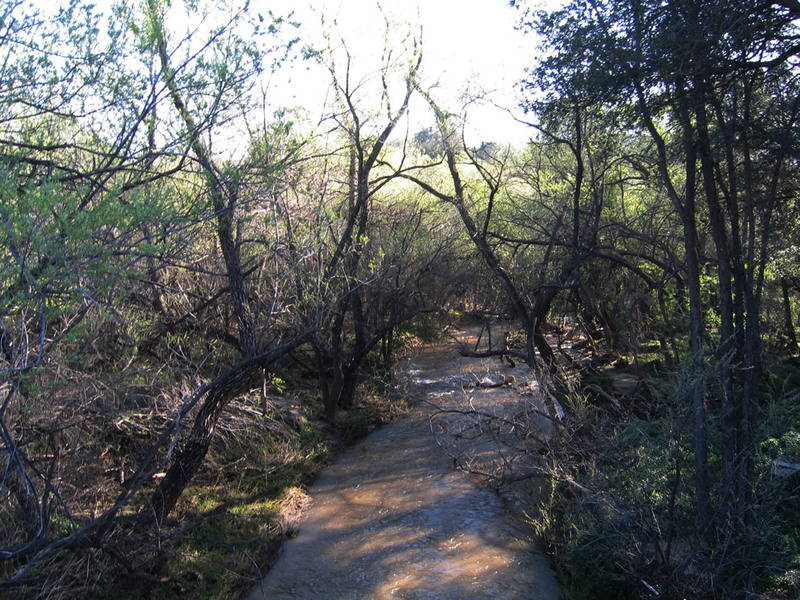 Note in the 2005 pictures the plentiful water flowing through the Sweetwater River as well as some blackened trees. The river was high due to an unusually wet winter in 2004-5, and the trees were burned in the 2003 Cedar Fire. 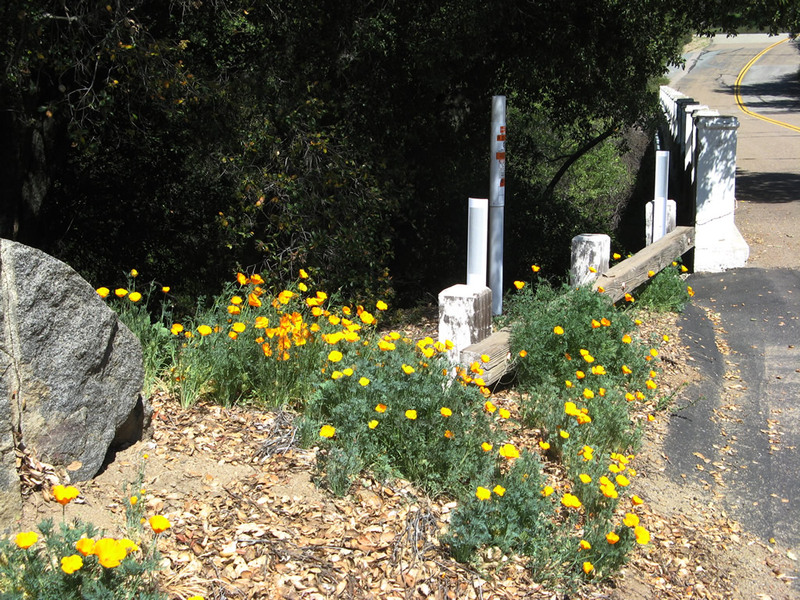 Orange California poppies, the state flower, adorned the bridge during that visit. Photos taken 04/29/07 and 03/12/05. 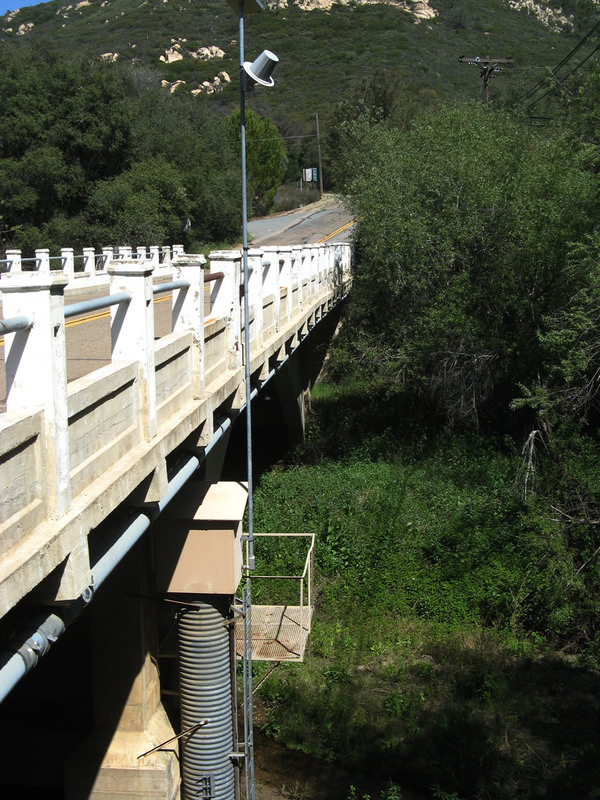 A second side trip off California 79 onto Wildwood Glen Lane reveals a tall, 1951 bridge that originally was built to bypass the nearby Los Terrinitos Bridge and allow a faster passage over the Sweetwater River for U.S. 80. 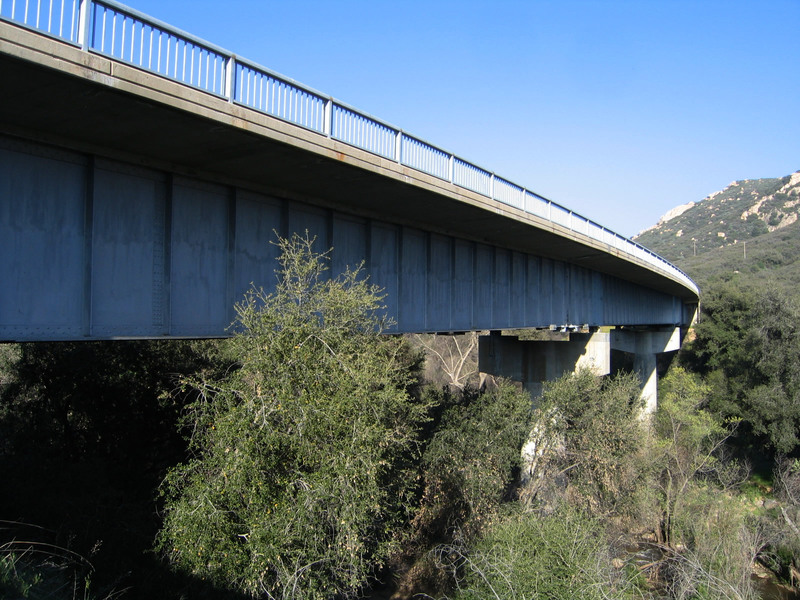 Built high above the Sweetwater River, this bridge was intended to become part of the U.S. 80 high-speed route that was slowly being developed through the mountains. 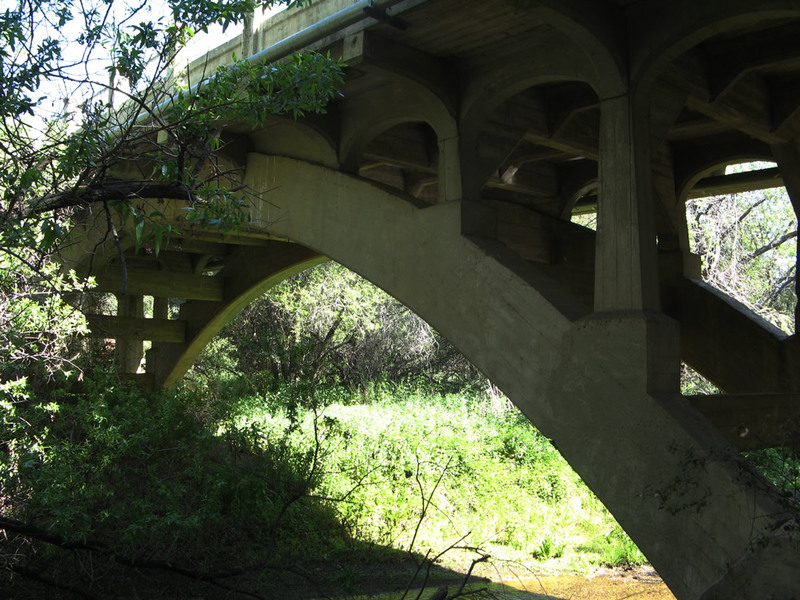 However, when Interstate 8 was rerouted onto a ridge south of here and this section of U.S. 80 became a dead-end road (Wildwood Glen Lane) the 1951 bridge was orphaned but is easily inspected by bridge and highway enthusiasts. Photos taken 04/29/07 and 03/12/05. 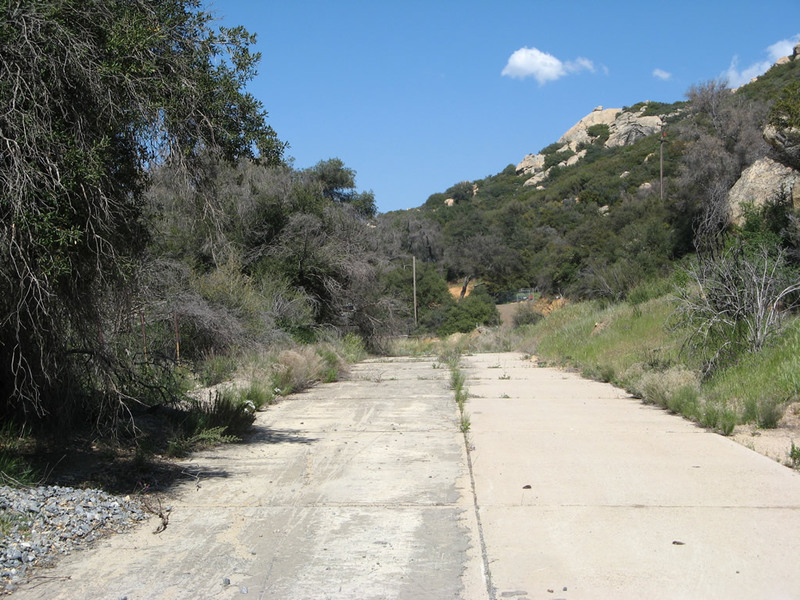 At the intersection of California 79 and Wildwood Glen Lane just east of the 1951 Sweetwater River bridge is an abandoned stretch of twin-slab concrete that used to follow a curve that connected the bridge with the modern California 79 alignment. Photos taken 04/29/07. 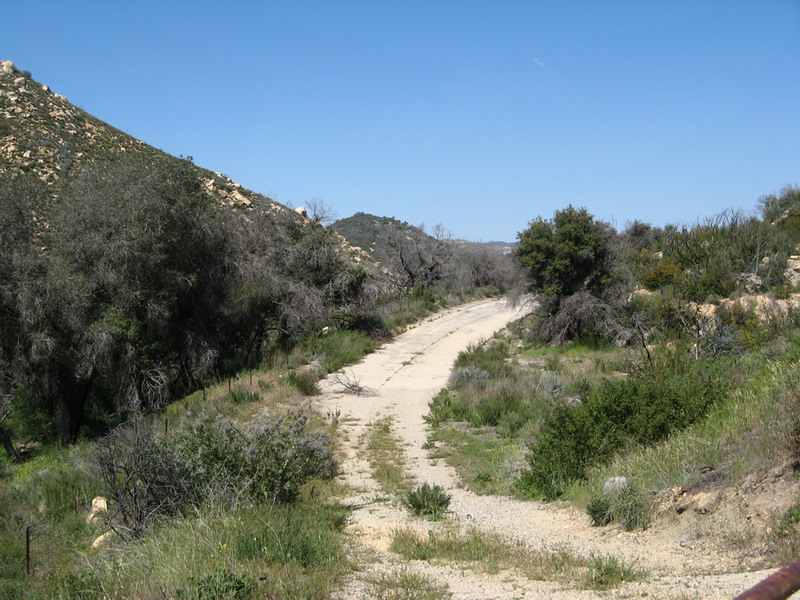 East of Viejas Indian Reservation and west of California 79 near Descanso Junction, this old alignment of U.S. 80 is located along Wildwood Glen Lane in Cleveland National Forest. 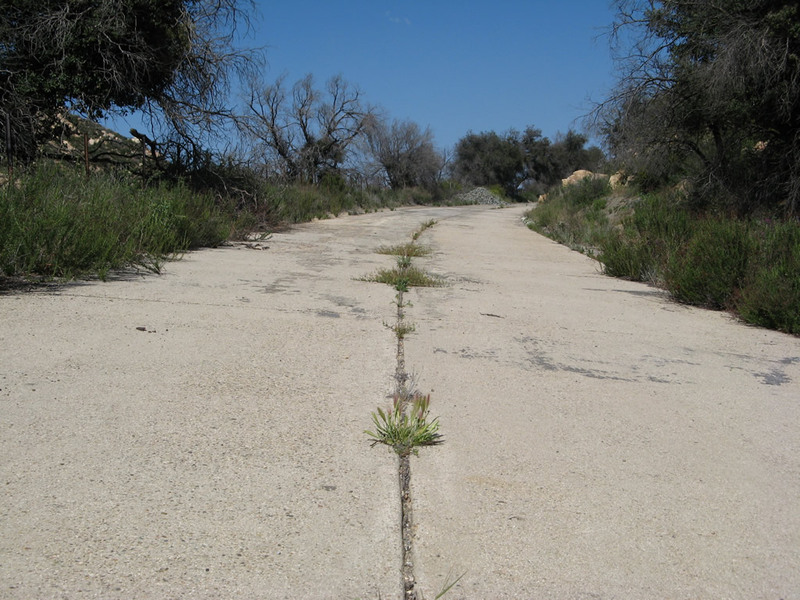 It has been closed off to vehicular traffic yet still has traversable, twin slab concrete poured in the early 1930s. 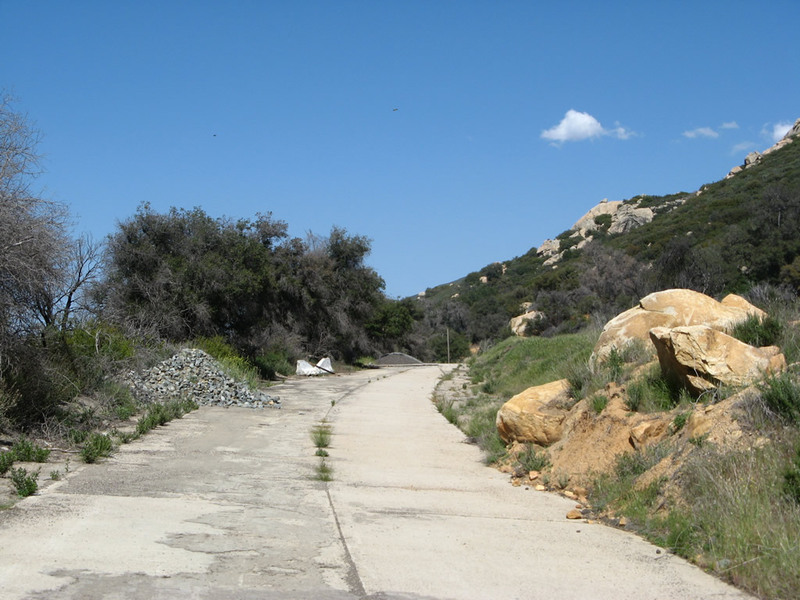 This series of pictures shows this old segment of highway, which may still be hiked. The walk from the dead-end of Wildwood Glen Lane is all downhill from Los Terrinitos Road to the point where the concrete ends, but this makes for a tougher uphill climb on the way back. Much of this area burned during the Cedar Fire of October 2003, but most of the brush vegetation had been restored by 2006 (three years later). Photos taken 10/14/06. 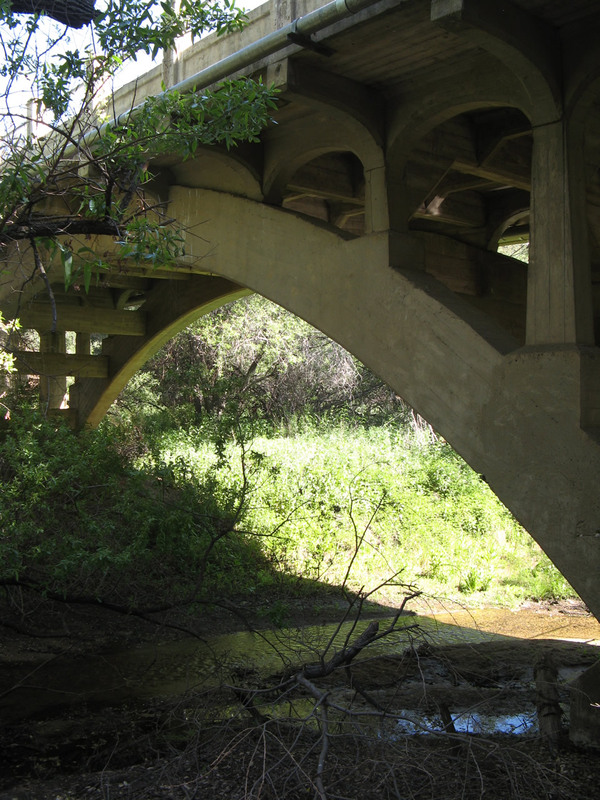 This arch bridge, located adjacent to the Old Highway 80 crossing over Pine Valley Creek, was the original auto trail bridge over the creek. 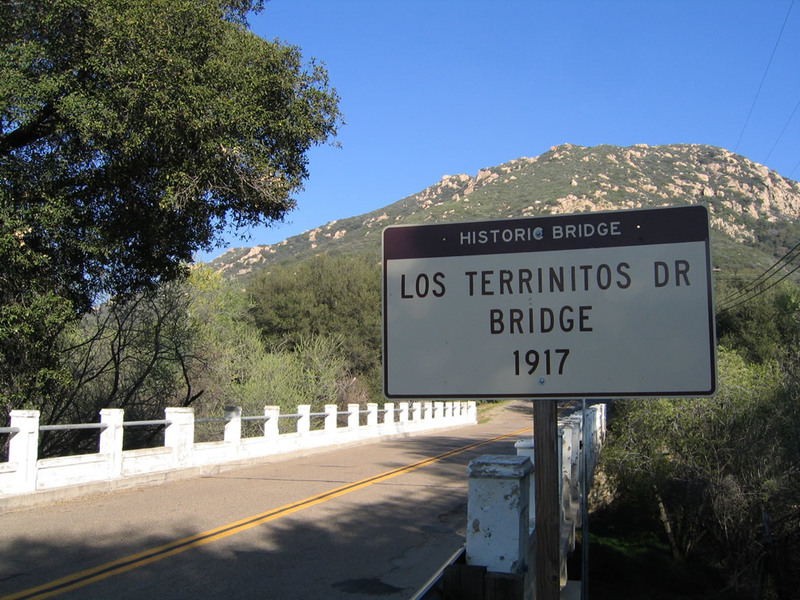 It was built in 1916 (some sources peg the opening date in 1917, just like Los Terrinitos Bridge over Sweetwater River east of here). 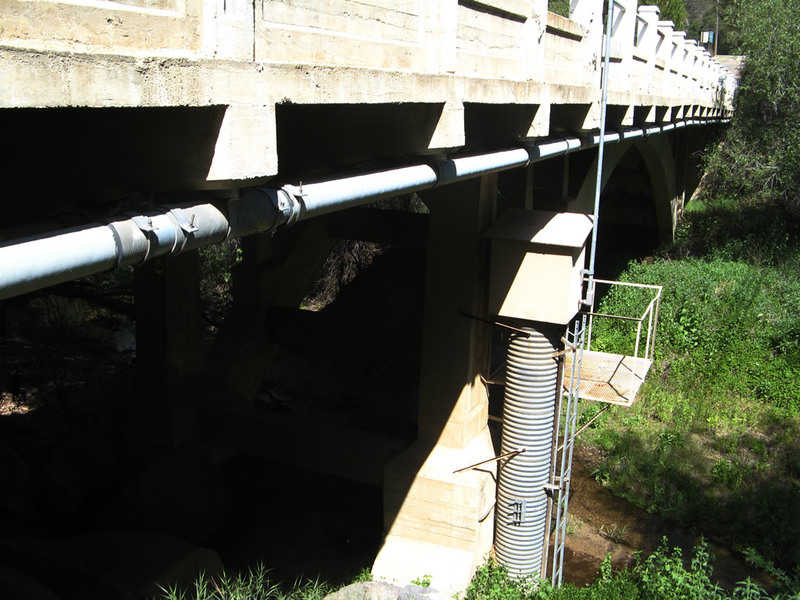 While the bridge still stands, it is no longer in use and sits on priviate property, making access with property owner permission impossible. 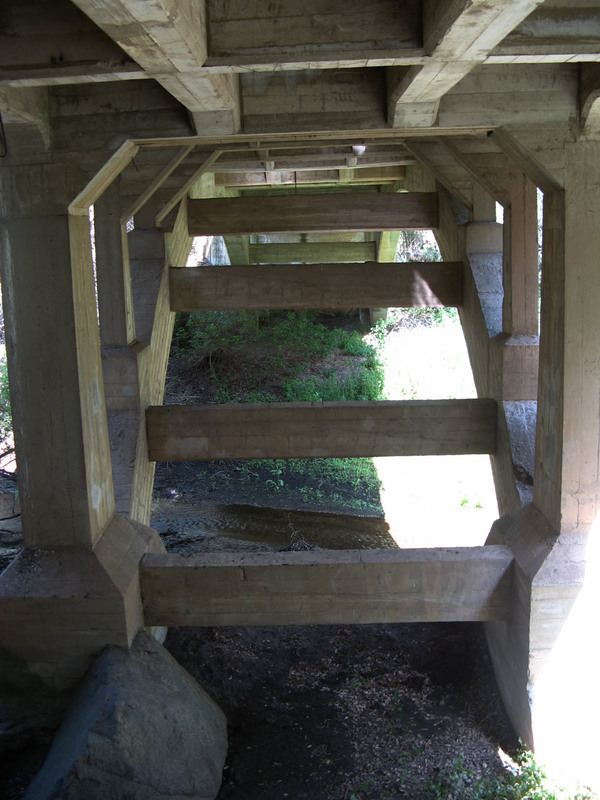 We took these pictures from the right of way adjacent to the old bridge. Photos taken 03/12/05. 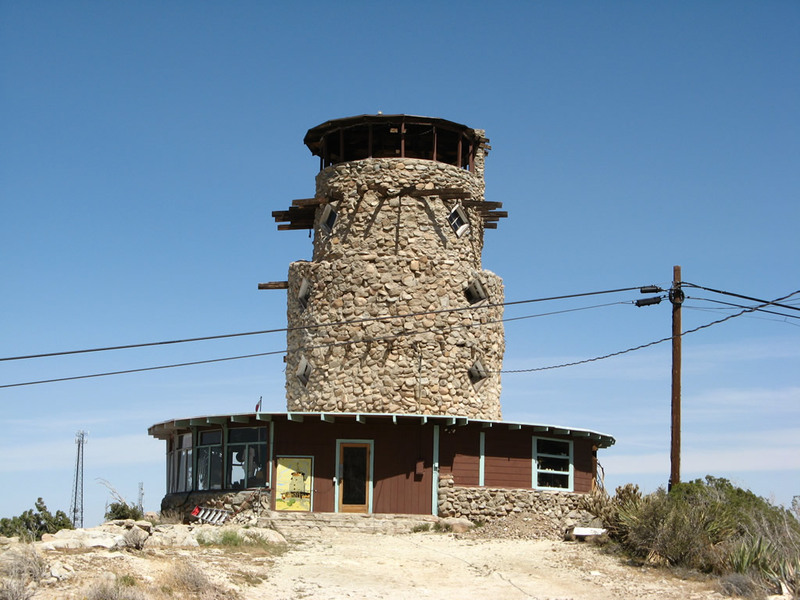 The Desert View Tower looks over the vast desert horizon from its perch above Interstate 8 and the In-Ko-pah Gorge. 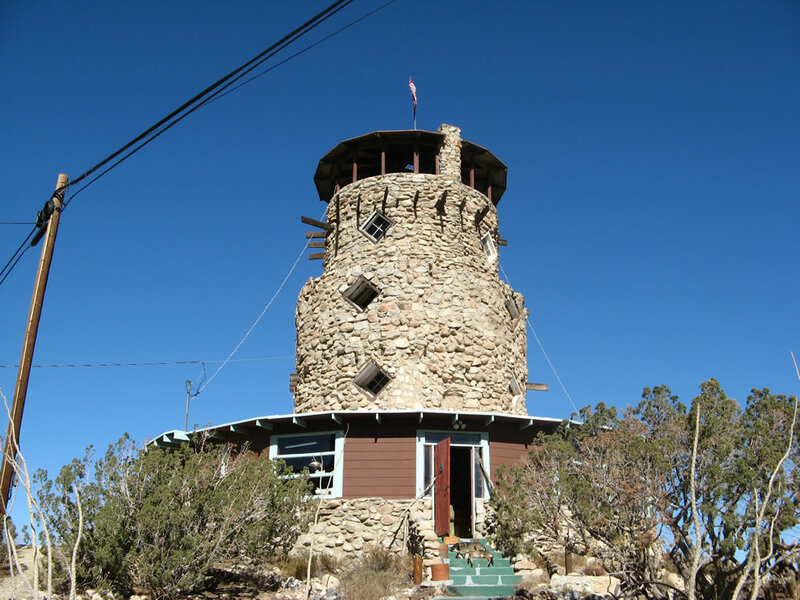 Built between 1922 and 1928 by Bert Vaughn (who at that time owned the nearby unincorporated community of Jacumba Hot Springs), the Desert View Tower is a well-known landmark for travelers along Historic U.S. 80, the Boulevard of America. 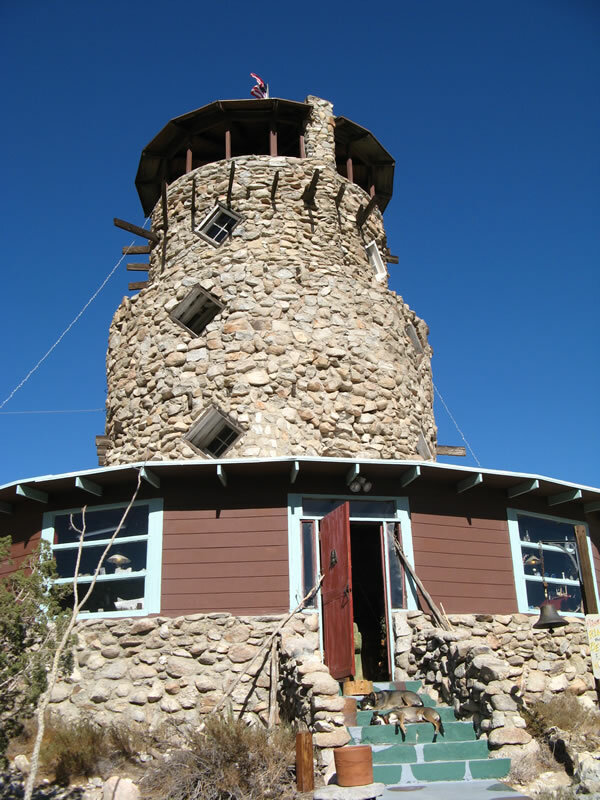 The tower is open for visitors for a nominal fee. Photos taken 01/15/07. 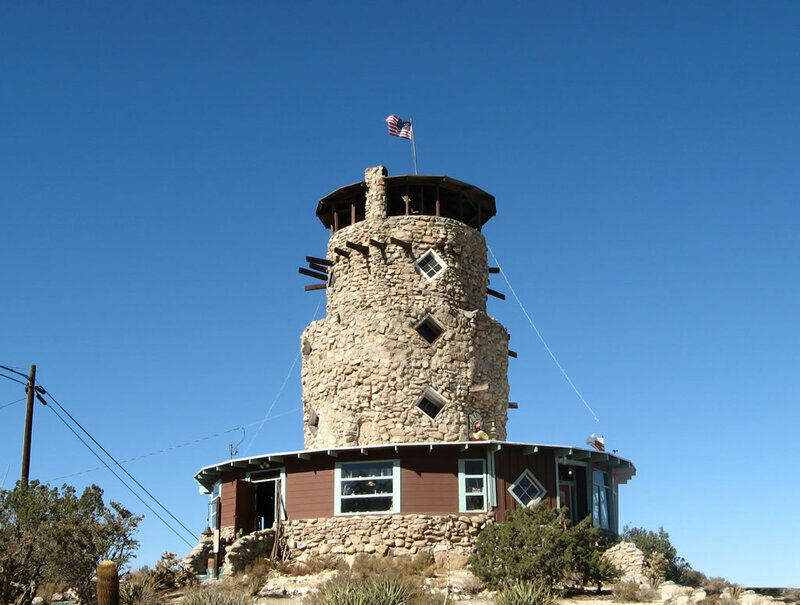 Built between 1922 and 1928 by Bert Vaughn (who at that time owned what is now Jacumba Hot Springs), the Desert View Tower is a well-known landmark for travelers along Historic U.S. 80, the Boulevard of America. 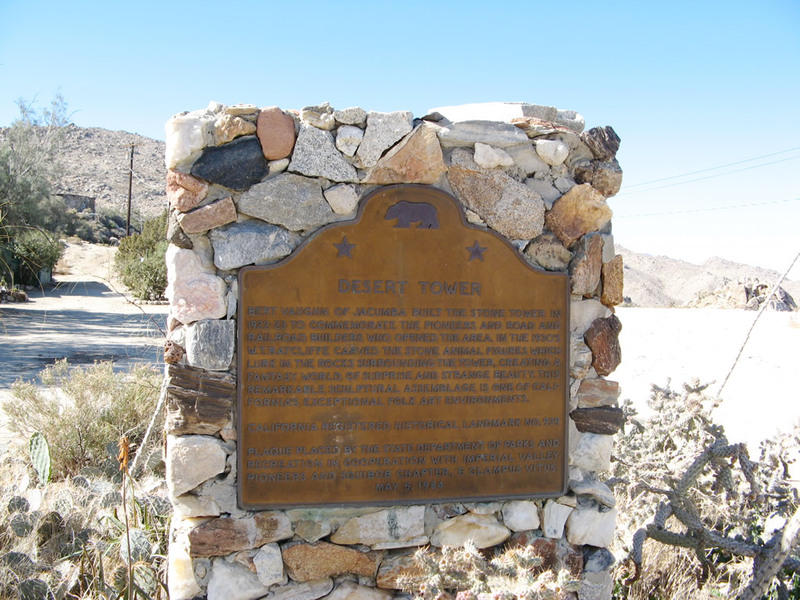 The tower was built to honor the railroad and highway builders who opened this area for travelers. Nearby rock sculptures were carved by W.T. Ratcliffe, an engineer, during the 1930s. Photo taken 01/15/07. 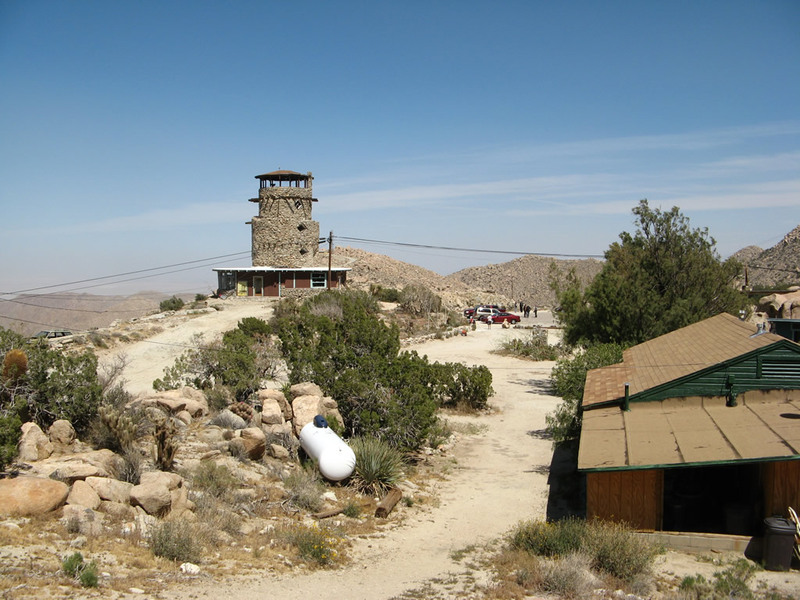 This view shows the Desert View Tower and some of the nearby buildings adjacent to the tower, looking south. Photo taken 04/19/08. The wind was howling on this day in January, after a winter storm passed through the area. The first view looks north at the tower. This resulted in clean air and stellar views of the Imperial Valley. The April 2008 photo was taken on a much calmer day; this view looks south at the tower. Photos taken 01/15/07 and 04/19/08. 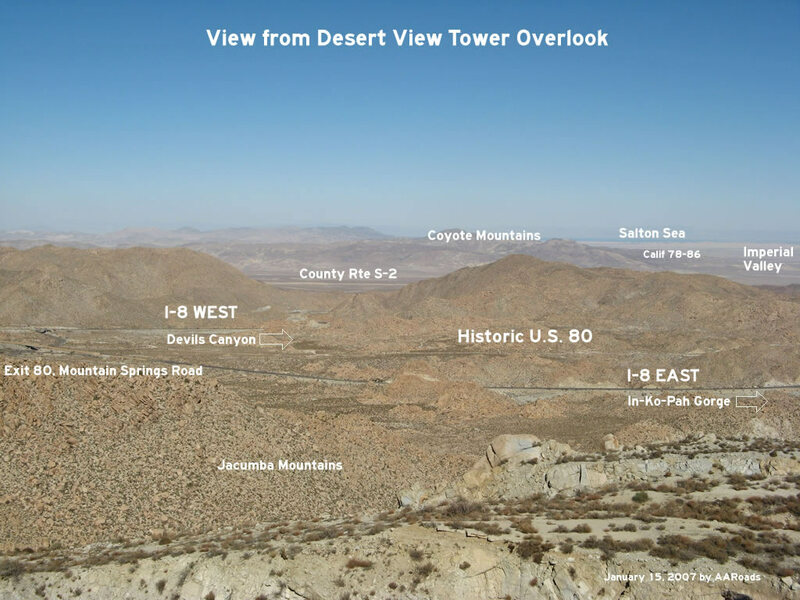 The "desert view" promised by the aptly named Desert View Tower can be seen in nearly all directions from the tower, but the most dramatic and compelling views look east toward In-Ko-Pah Gorge and the Imperial Valley. Since Interstate 8 passes directly below the tower, a fence prevents people from accidentally traveling too far away from the tower and falling to the freeway below. 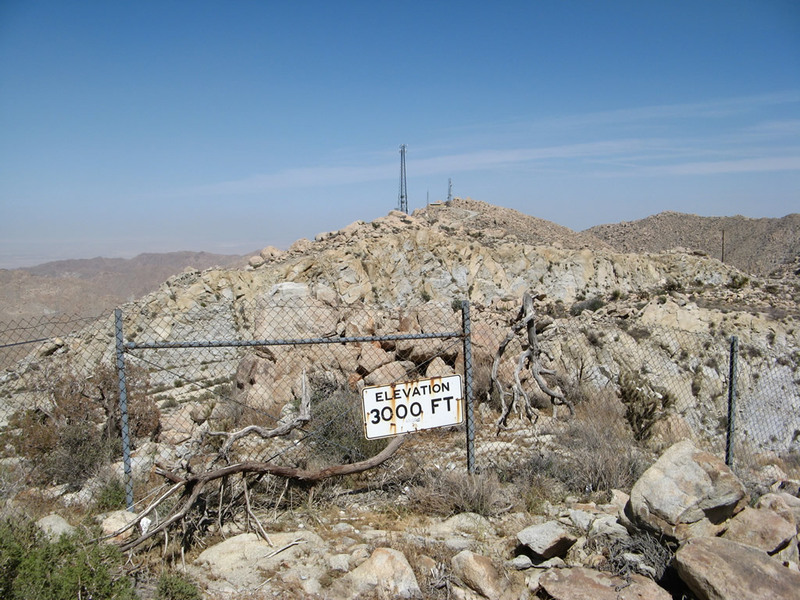 Affixed to one of these safety fences is this old 3,000-foot elevation sign, which was probably located along Old U.S. 80 at some point in the past. Photos taken 04/19/08. 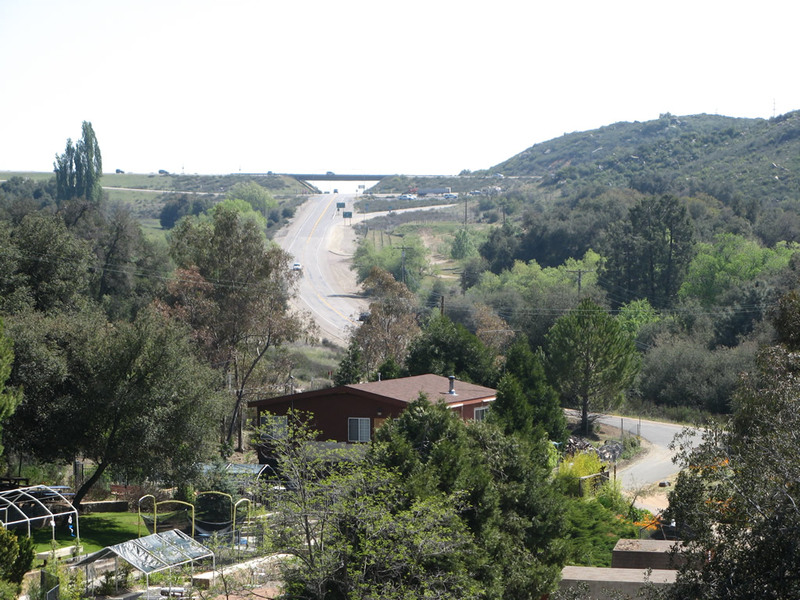 Looking east from the Desert View Tower, the alignments of Interstate 8 east and west split after the Mountain Springs Road interchange (Exit 80). In the distance is the Salton Sea. Photos taken 01/15/07. 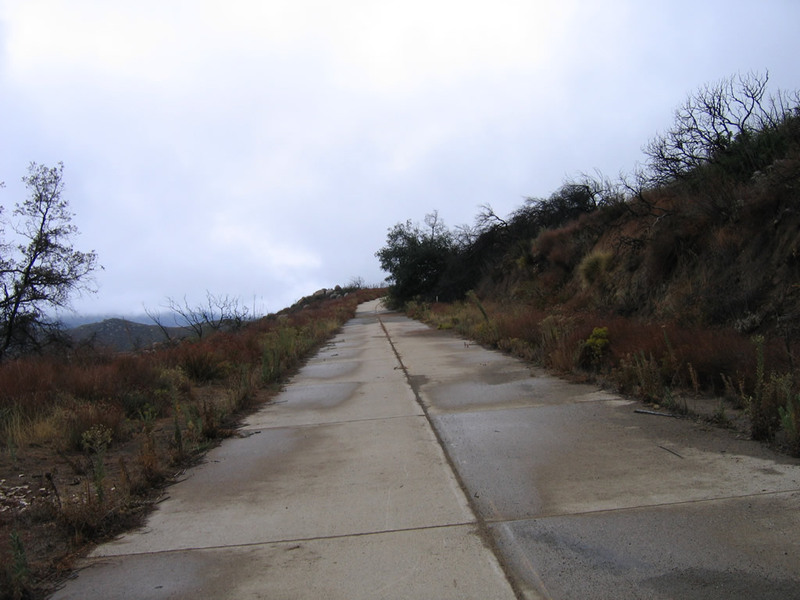 This series of pictures showcases a long stretch of abandoned, single-slab concrete that was originally built in the 1910s prior to the official commissioning of U.S. 80. 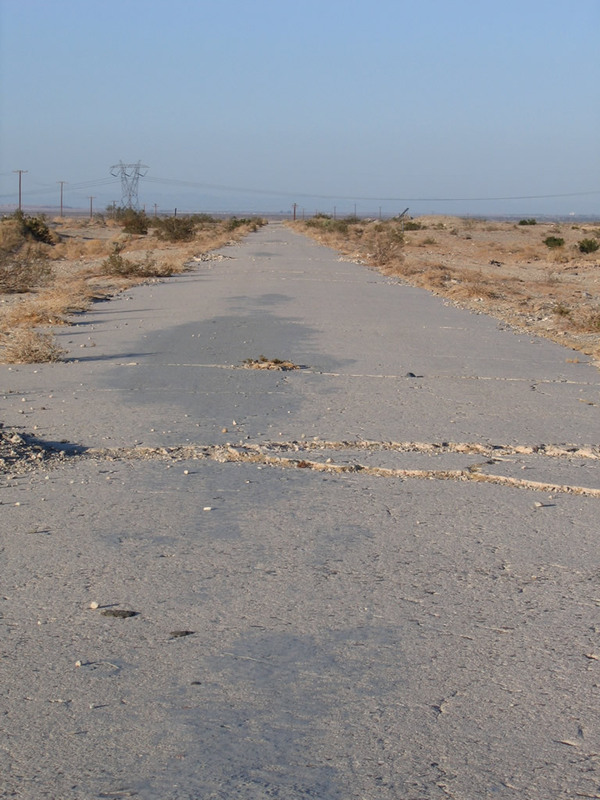 With the creation of U.S. highways in 1926, U.S. 80 was signed along this route until it was bypassed by a more modern asphalt highway that now carries Imperial County S-80 (Evan Hewes Highway). 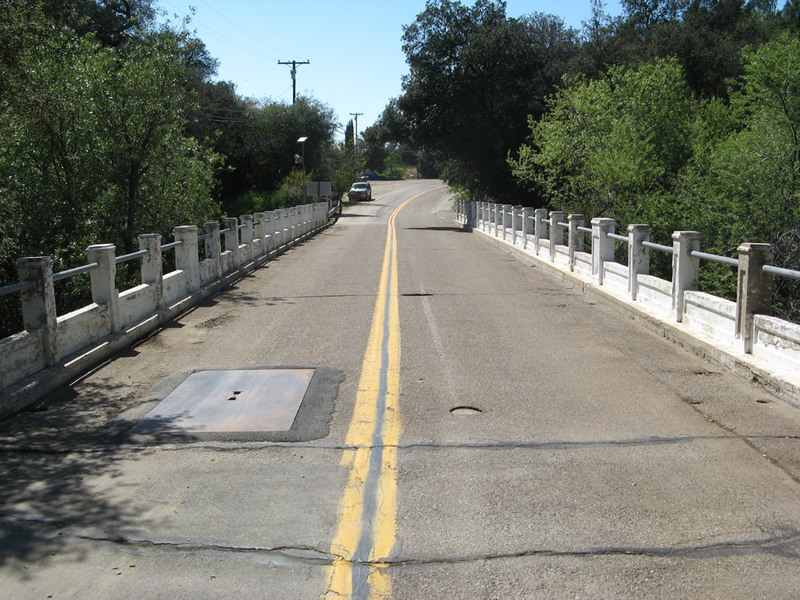 It is not clear when this rerouting happened; it was possibly dated to the 1930s or 1940s given the age of some of the nearby bridges on the "newer" route. Several C-block monuments line this old stretch of highway. 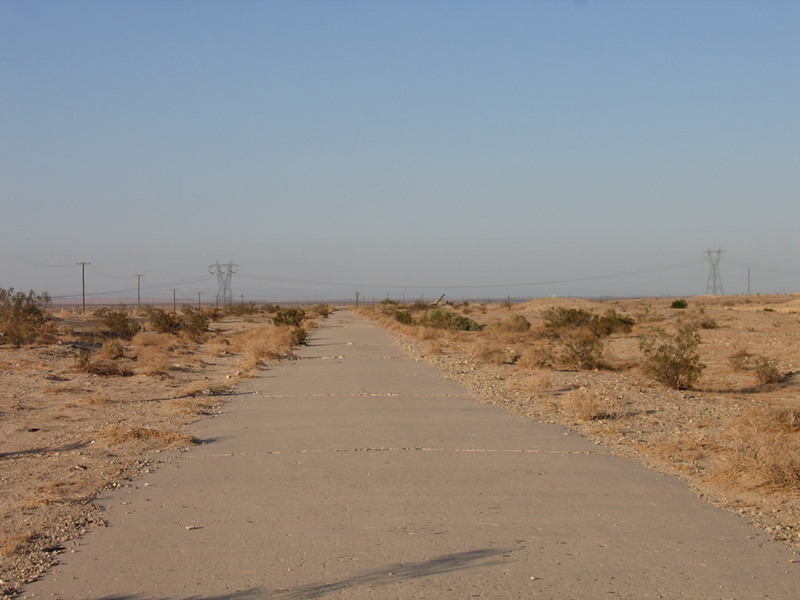 Nearby, the Southwest Powerlink (a 500kV power line operated by San Diego Gas & Electric) passes by this unused road; it connects a substation in Bonita with another substation in the western Imperial Valley. Photos taken 08/20/06. 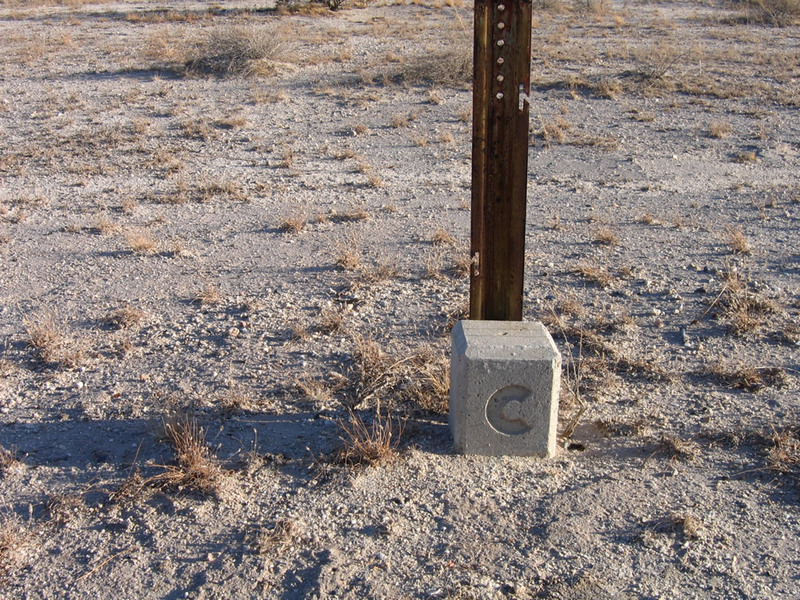 Between Plaster City and Seeley, plenty of C-block monuments line the modern highway, which overlays the historic U.S. 80 alignment for the most part. Look for paddles next to the concrete monuments, which designate the rights of way for the former state route. 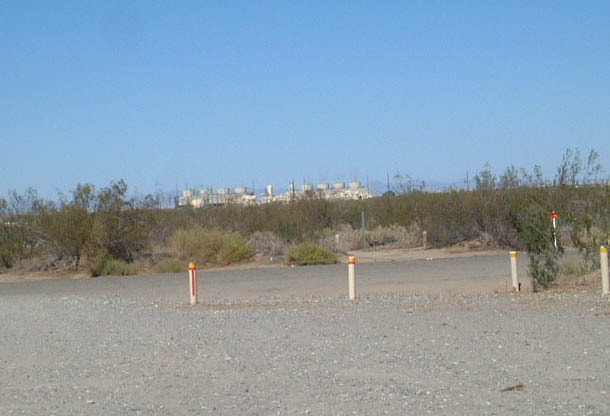 This particular C-block was located on the south side of S-80/Evan Hewes Highway in the Yuha Desert in the Imperial Valley. Photos taken 08/20/06. 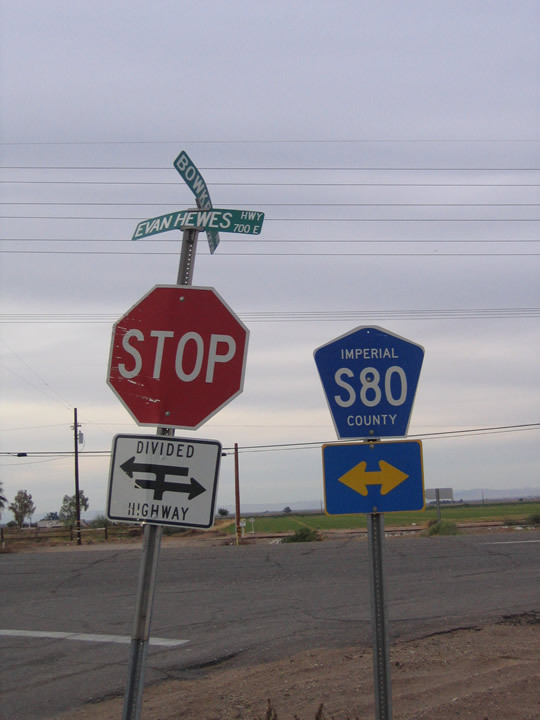 The section of Historic U.S. 80 along Evan Hewes Highway between Ocotillo and the intersection with California 115 west of Holtville is signed as Imperial County S-80. This S-80 trailblazer is posted along Northbound Imperial County S-2 between Interstate 8 and S-80. Photo taken 10/14/06. 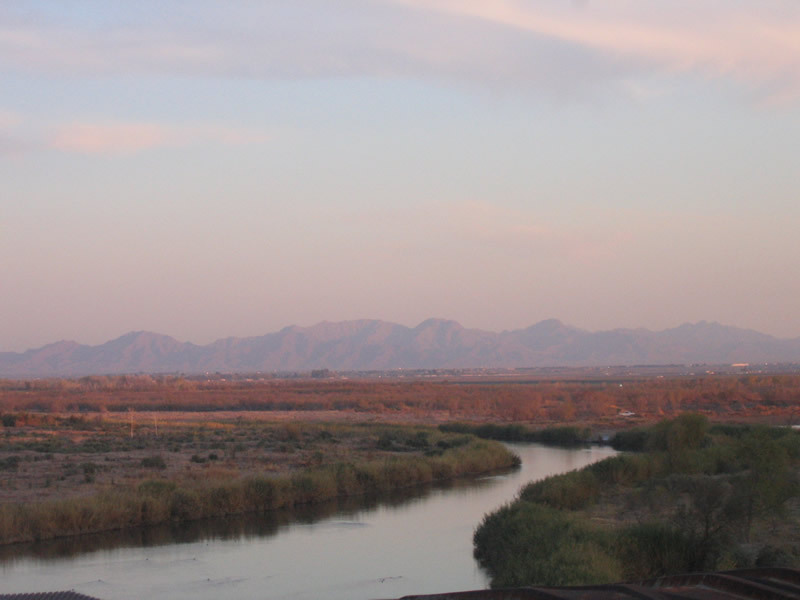 View of the Highline Canal looking north near the hot springs. 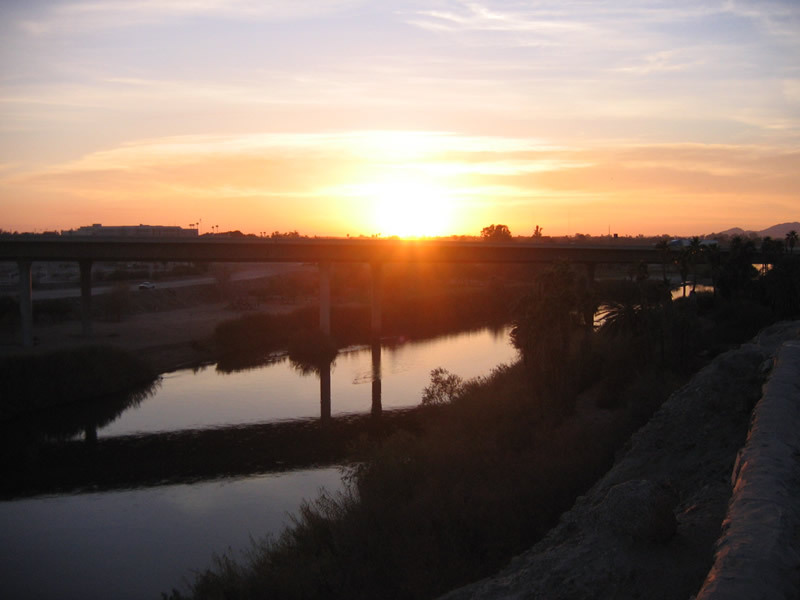 To the left (west) of the canal, a Southern California Edison transmission line begins its northerly journey toward the Los Angeles basin via the Highline Canal, staying east of the Salton Sea. It picks up additional power from a variety of geothermal plants located along its route. 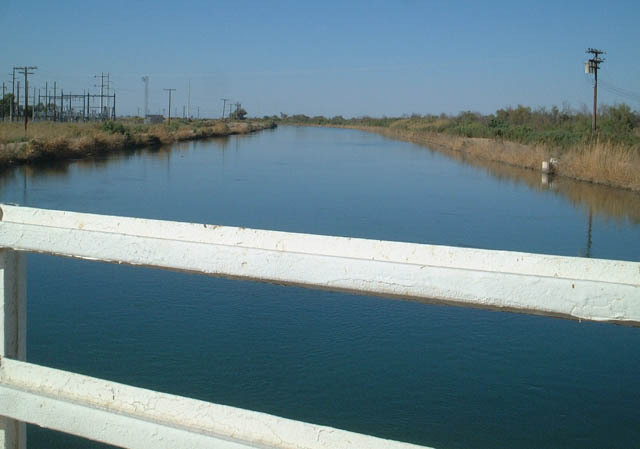 The Highline Canal marks the eastern edge of the expansive agricultural area of the Imperial Valley. 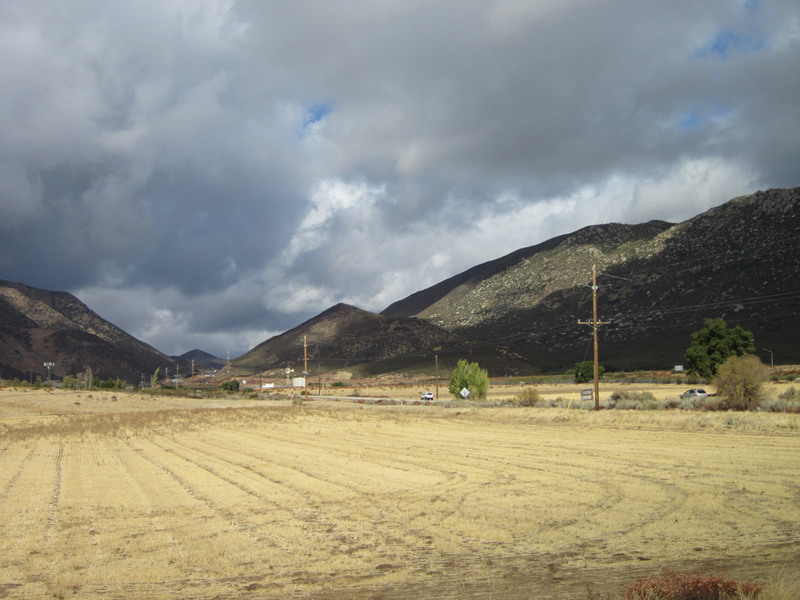 Agriculture is prevalent from here west to the New River, west of El Centro. The contrast between green, lush fields and brown, barren desert is startling. Photo taken 10/05/02. View of a geothermal plant located to the north of U.S. 80 and east of the Highline Canal. 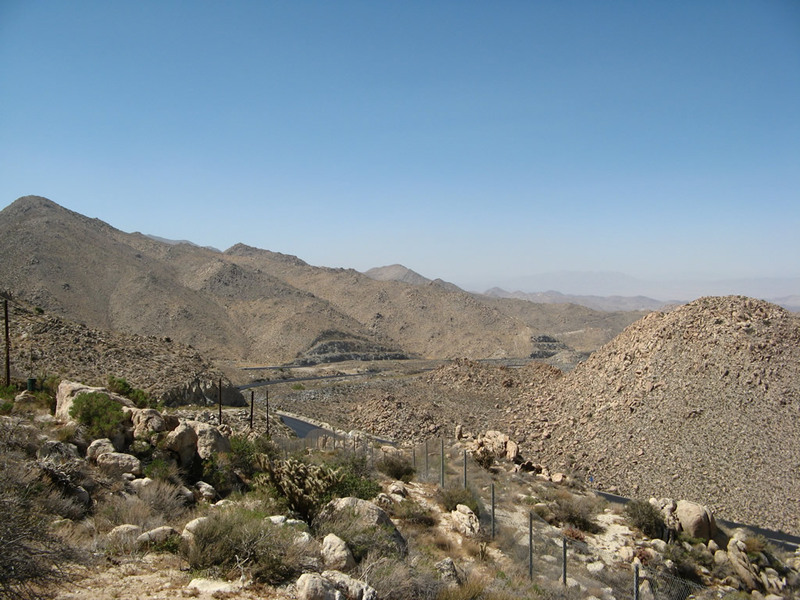 The plant produces electricity that is routed onto the transmission grid, destined for homes both in Imperial County and in the Los Angeles Basin. This plant (and others like it) takes superheated water from the ground and uses it to turn turbines and generate electricity. 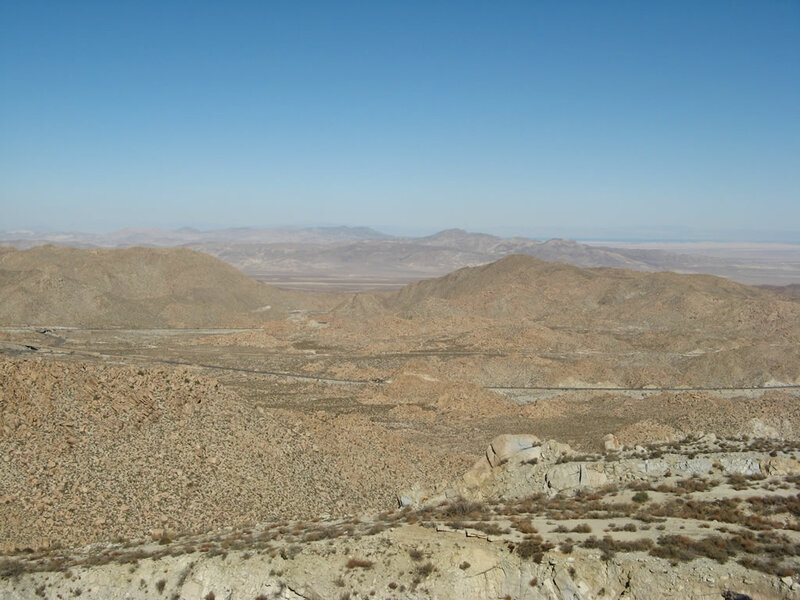 The entire eastern portion of the Imperial Valley is geothermicly active due to its narrow crust (and relative proximity to magma) as well as the number of fault lines that cross the region. 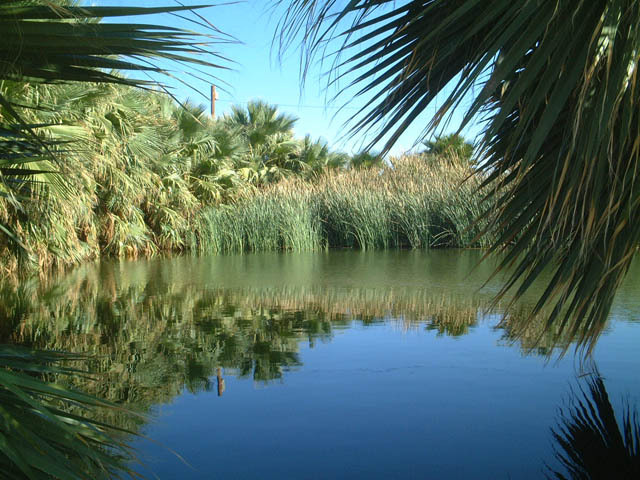 The famous San Andreas Fault, for instance, culminates its north-south journey under the Salton Sea, a 45-minute drive northwest of here. Photo taken 10/05/02. 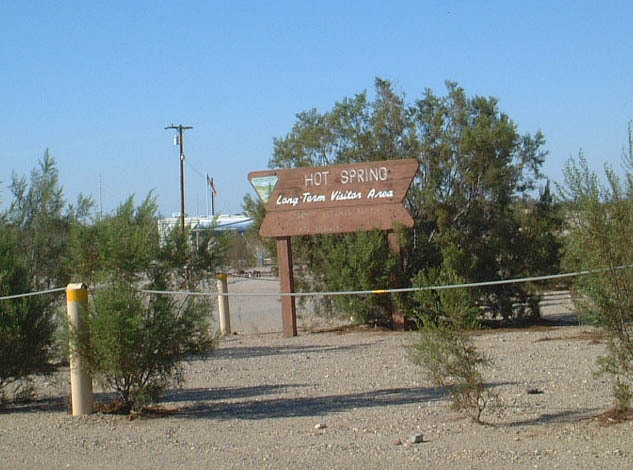 At the site of the hot springs itself, there is a camping area (referred to as "long-term visitor area" in this photo) on the north side of U.S. 80. 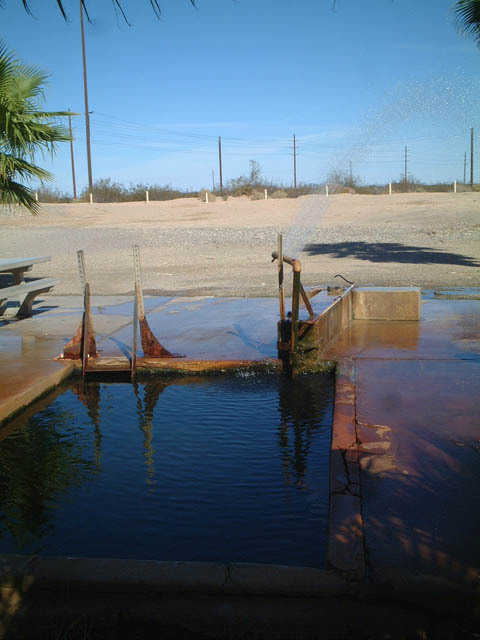 The actual hot spring is located to the south of U.S. 80, and it is squeezed between a fairly narrow space between U.S. 80 and Interstate 8. The long-term visitor area features weekly use camping areas, and many of the visitors are "snowbirds" seeking to escape the cold of the northern states in their recreational vehicles. During the mild winter months, there is a fee to stay in the long-term visitor area; during the hot summer months, it is free. The entire facility is operated by the Bureau of Land Management (BLM). Photo taken 10/05/02. 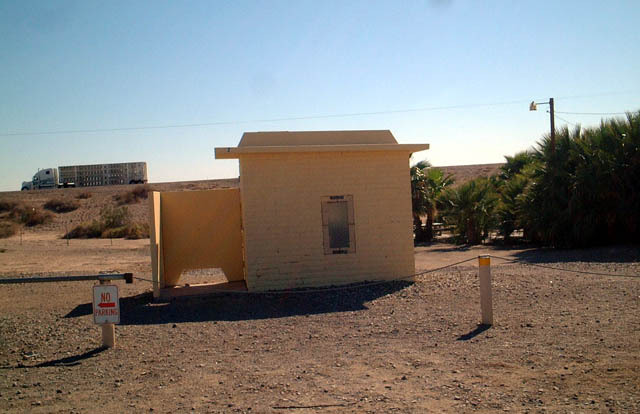 View of one of the two outhouses at the hot spring parking area just south of Historic U.S. 80. The hot spring is located behind the outhouse. Photo taken 10/05/02. 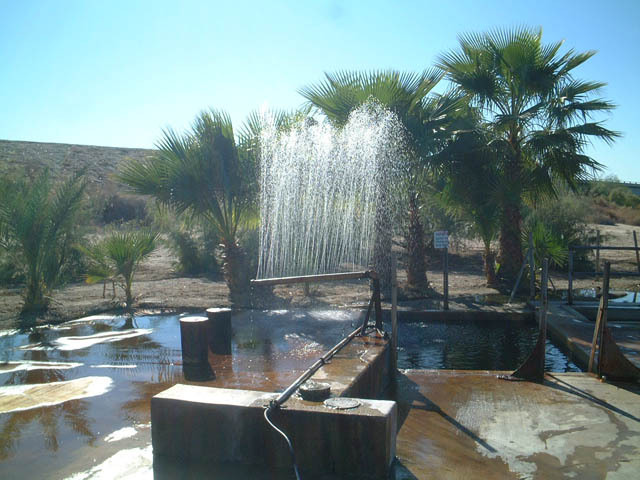 The hot spring is pumped from a well through a pipe. A portion of the water is directed into a concrete tub, while the rest is propelled through a sprinkler, which is visible in this picture. The water is usually in the mid-100s (degrees Fahrenheit). Much of the area is surrounded by palm trees. Photo taken 10/05/02. 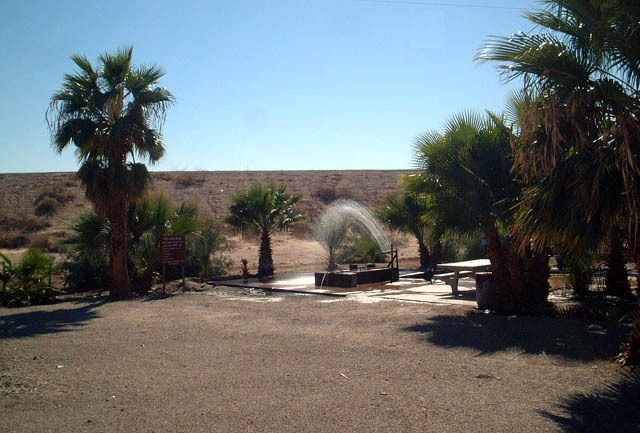 This picture, looking north, shows the hot spring tub in the foreground and the sprinkler in the background. The power lines in the distance mark the location of U.S. 80 in relation to this picture. Interstate 8 is behind the spot where this picture was taken. Photo taken 10/05/02. Another view of the hot springs, this time looking south. U.S. 80 is behind the vantage point of this picture, and "hill" in the background is Interstate 8. Photo taken 10/05/02. 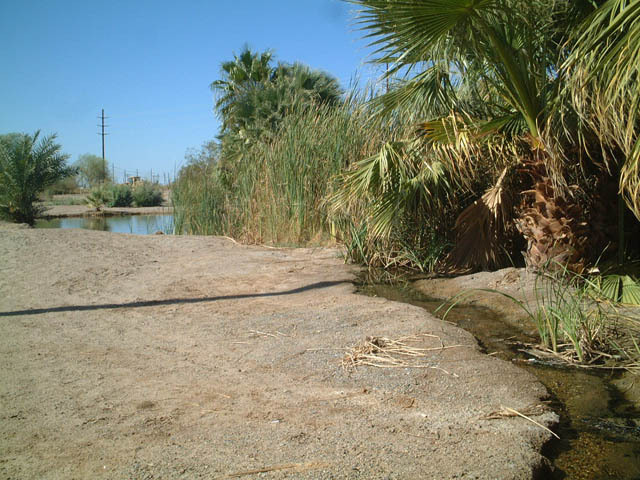 This tiny river carries the excess hot water from the concrete hot tub into a small pond adjacent to the hot spring itself. 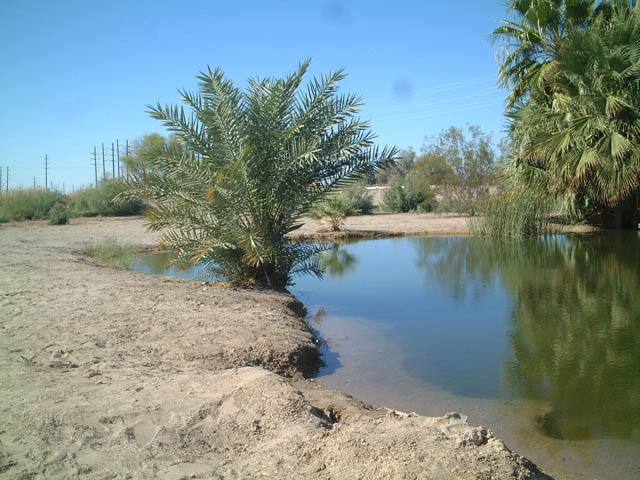 The pond contains warm water, but it is not nearly as hot as the water in the concrete tub or the sprinkler. Photo taken 10/05/02. 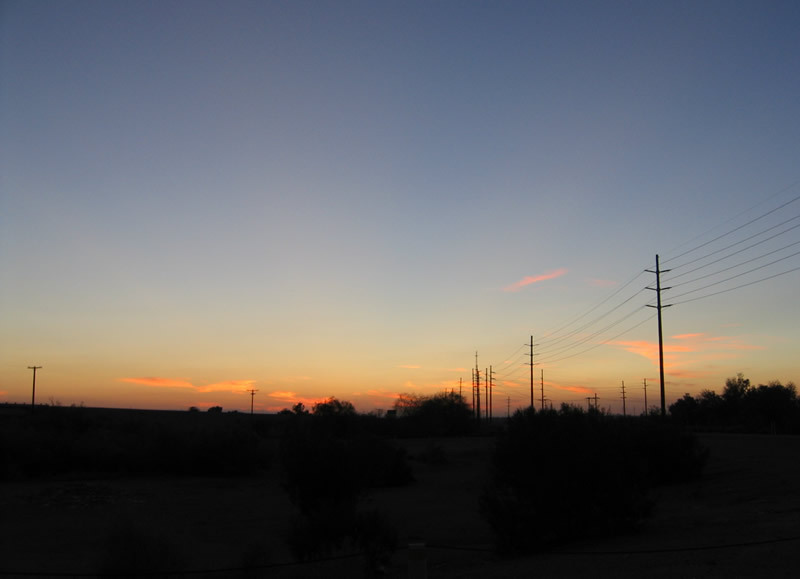 This view of the sunset was taken from the Holtville Hot Springs. Photo taken 08/27/04. These pictures show the lush environs surrounding the pond. 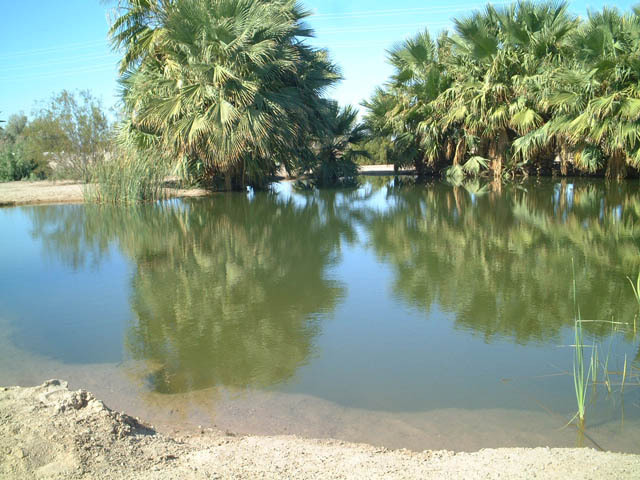 This pond has several varieties of fish living in it, and swimmers use it to cool off after lounging in the hot springs. Photos taken 10/05/02. 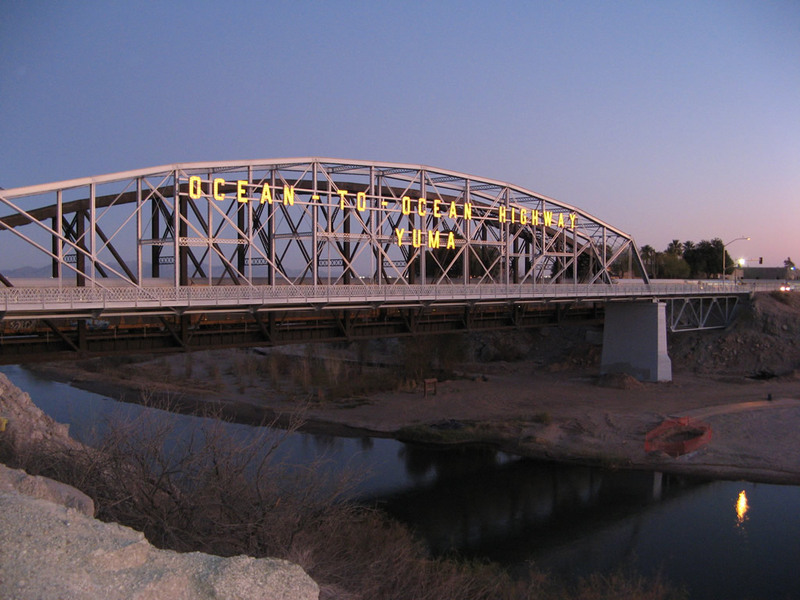 To the north of the Ocean to Ocean Highway Bridge lies the adjacent railroad truss bridge over the Colorado River as well as the meandering river, cutting a line between California and Arizona. Photos taken 01/27/06. 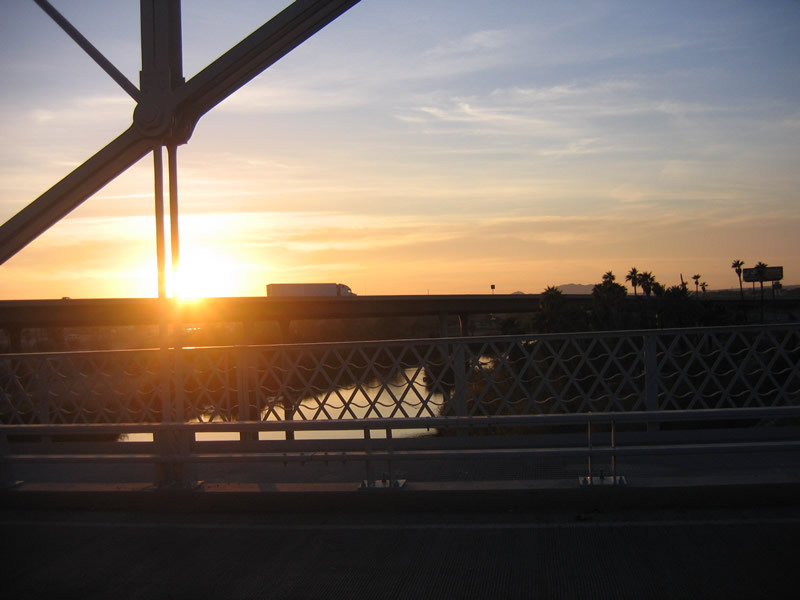 Looking south from the Ocean to Ocean Highway Bridge, the sun sets on the Interstate 8 bridge over the Colorado River. Photos taken 01/27/06. 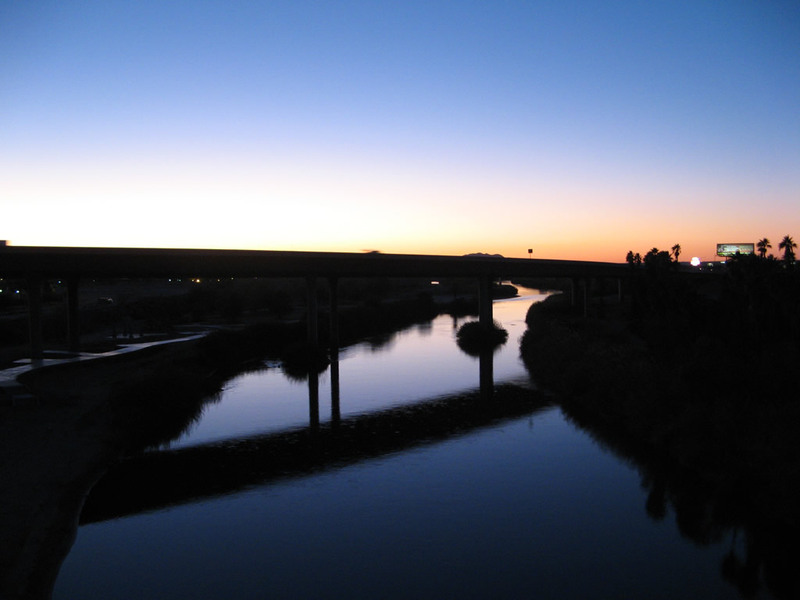 Here&apos; an evening shot taken from the same spot, looking south at the Interstate 8 bridge. Photo taken 01/15/07. This suite of pictures shows the Ocean to Ocean Highway Bridge as seen during twilight hours from a hill next to the bridge on the California side. 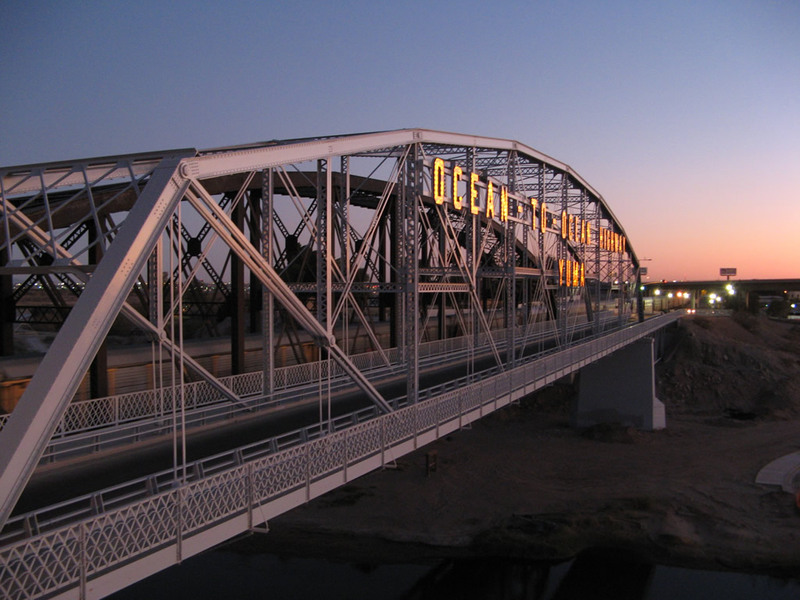 The name of the bridge and "Yuma" are written into the truss, adding to the allure of this bridge. Photos taken 01/27/06. A year later, these photos show the Ocean to Ocean Highway Bridge during the evening just after sunset. 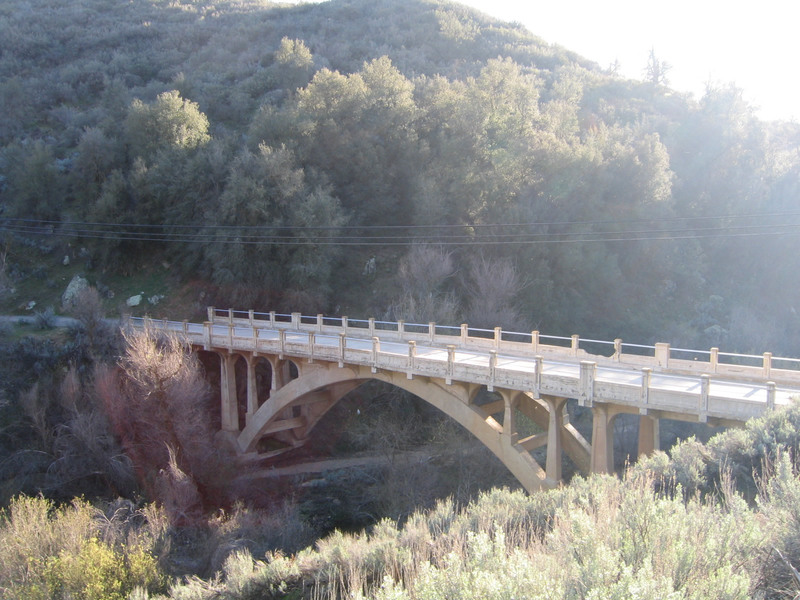 The restored bridge remains a sight to behold for fans of old highway bridges. Photos taken 01/15/07. 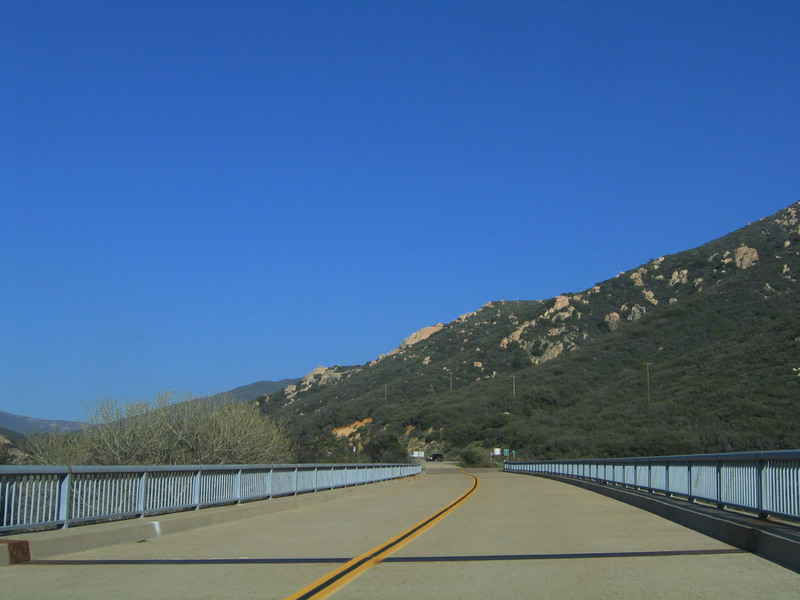 Historic U.S. 80 in California, Yuma to San Diego, produced for the Historic Highway 80 Committee by Steve Varner of AmericanRoads.us (2006/First Edition). 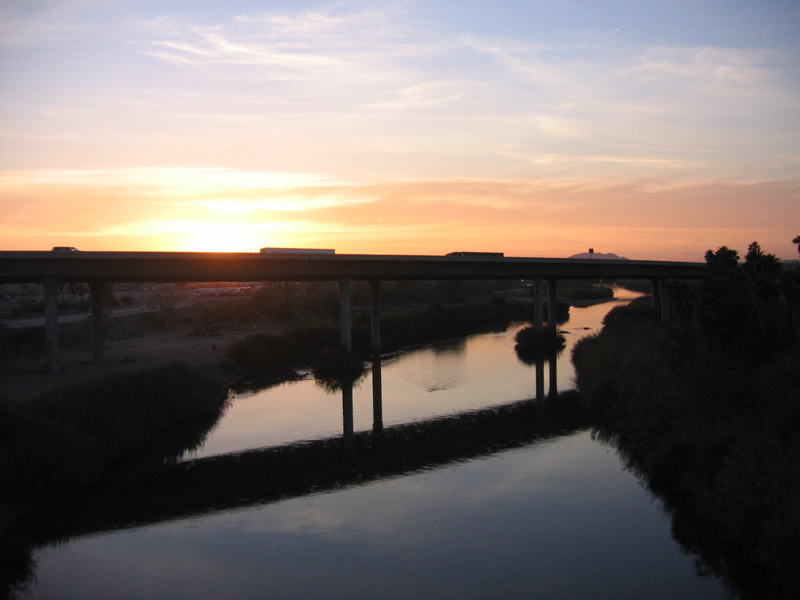 This is an excellent resource for locating remaining alignments of U.S. 80 in San Diego and Imperial Counties, including the prior routes taken by U.S. 80 in the city of San Diego. Finding U.S. 80: The Broadway of North America by Casey Cooper. 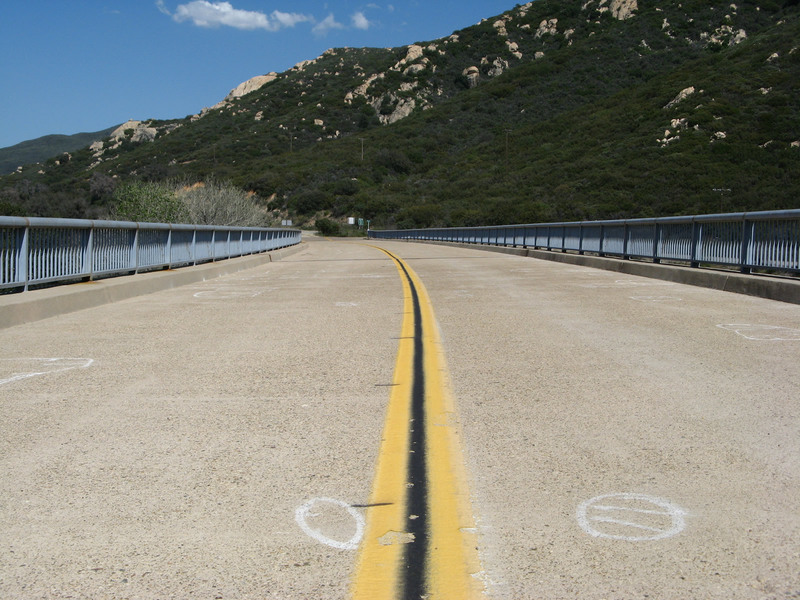 This excellent site contains historical photos of U.S. 80 from California Highways and Public Works, the old California Division of Highways journal. U.S. Route 80: The Dixie Overland Highway by Richard F. Weingroff, Federal Highway Administration. Tybee Island became the eastern terminus of U.S. 80 in 1929, an extension from Savannah, Georgia. U.S. 80 was shortened in phases between 1964 and 1991, so it could no longer be considered a transcontinental highway today. As stated in the article, "The shortening began in California. 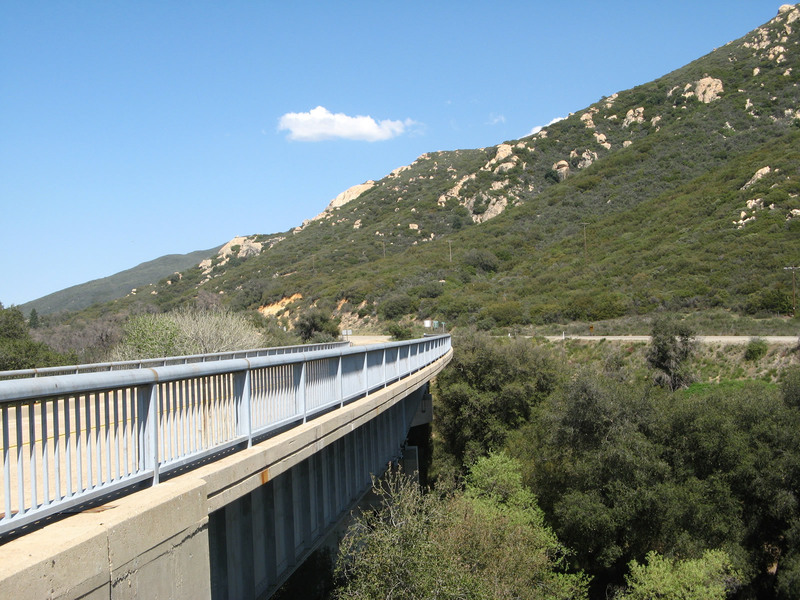 Under State Senate Bill 64, California renumbered its State highway system, effective July 1, 1964. The State law provided that each route should have a single number, with precedence given to retention of present sign route numbers in the following order: Interstate routes, U.S. numbered routes, and State sign routes. 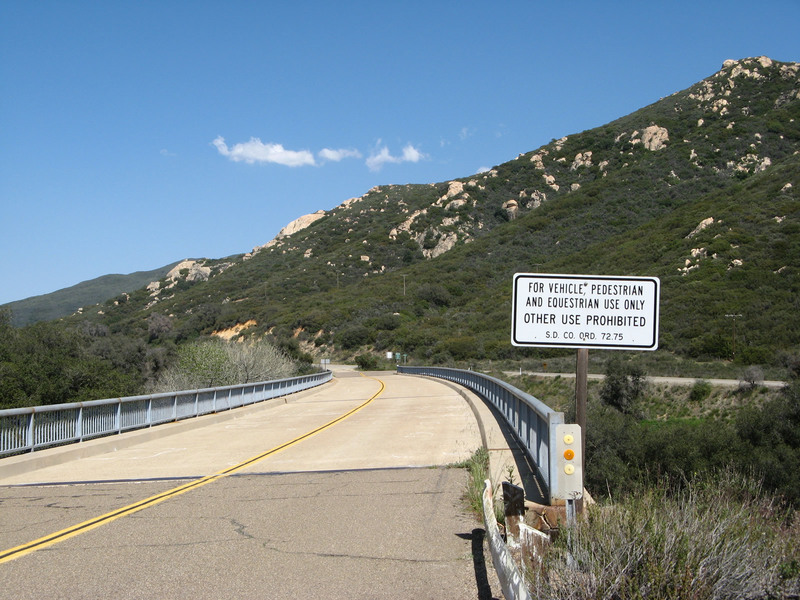 To comply with this requirement, California asked AASHO to remove the State&apos; section of U.S. 80 from the official log. The changed was first reflected in AASHO&apos; U.S. route log published in 1969." Maps and field observations indicate U.S. 80 signs were removed in California by 1974, the same year Interstate 8 was completed in that state. Many similar articles can be found at FHWA Highway History Articles. Page Updated February 27, 2013.